Well, we just went on perhaps one of the VERY best family vacations we’ve ever taken. We went to Washington D.C. over spring break and had a FANTASTIC time!! Rise and shine! We left our house at 4:00 in the morning to get to the airport so that we had as much time as possible on day one in D.C. Here we are at the airport about to enjoy breakfast before boarding our flight. …I didn’t want to leave out Madeley 🙂 . On the street walking to lunch. We were headed toward the White House for our first stop and saw a busy little Mexican restaurant on the corner, so we stopped and ate. (The guacamole was INSANE!) The first two days, the weather was cold (35ish) but bright and sunny. This boy was thrilled to be there! …here we are inside visitors center. We loved this place! All of the visitors centers/museums we visited were very interactive and kid-friendly. 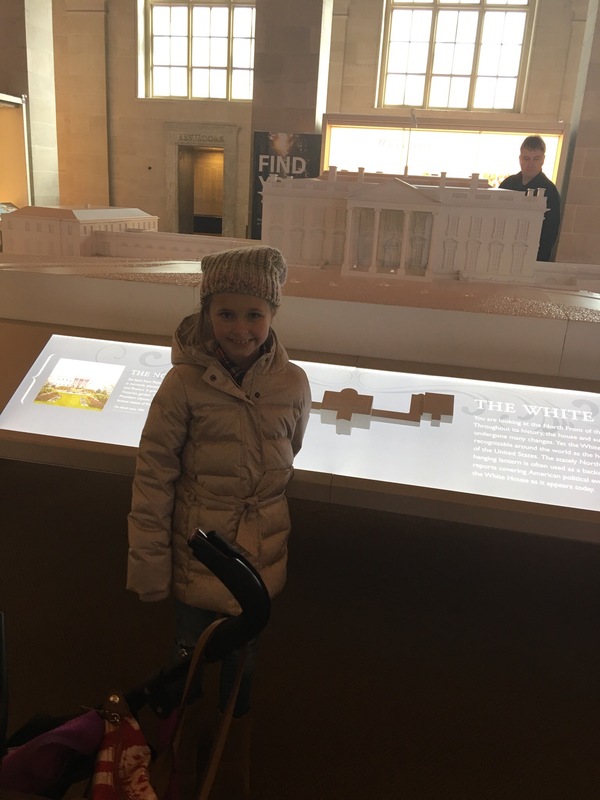 They showed a quick little documentary about the White House, the kids could interact with almost every station/exhibit…it was fun, informational and educational. Something else…I think we hit D.C. at just the right time (first weekend in March) because it was not busy at all. We didn’t wait in one line the entire time we were there. Several people told us that it gets slammed starting mid-March and stays busy through early fall and then again at the holidays, and that we picked a good weekend to visit. We walked right in everywhere we went, never waited and it never felt crowded. We took our time visiting here and soaked up as much as we could. Madeley is all like “you people woke me up at 3:00 AM!”. She slept about an hour and a half as we walked and toured 🙂 . Side note, before we went to NYC over Christmas break, we bought both little girls ski pants to wear. 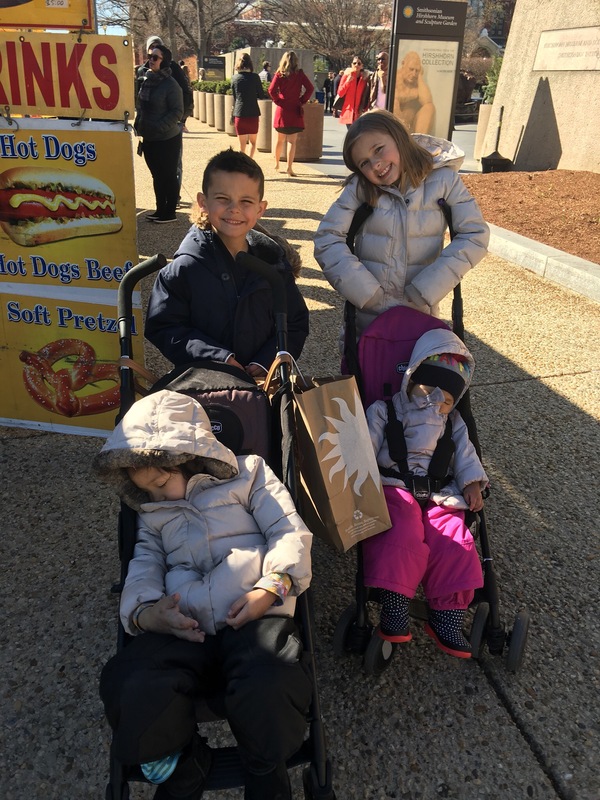 Since they’re in strollers and not moving as much, they get colder faster…plus, if there is rain, this keeps them dry. We used the pants again every day in D.C. We just slipped them right over their normal clothes for the day. After we left the visitors center, we walked around to the front of the White House for a view. She decided to wake up for this part 😉 . Selfie with the White House! 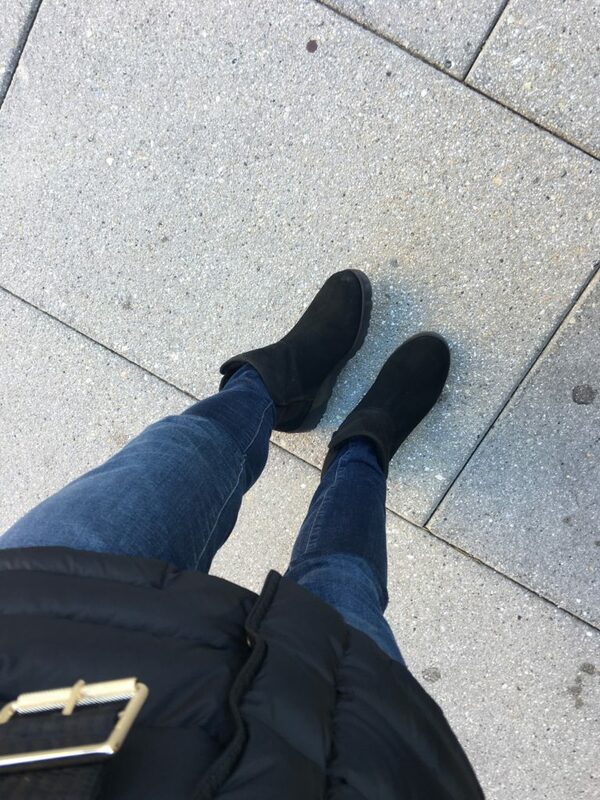 Side note, you know how much I love, love, love my Kara style Ugg boots and have worn them several times on big city trips…well, right before we left, I saw these Uggs in the store and bought them too. They’re just like my other Uggs but short (so my legs don’t get hot at all). I walked miles and miles in them on this trip (I mean…MILES! Like 6+ a day!) and my feet were never cold and NEVER hurt 🙂 . …and Smith would tell you that this was his favorite part of the trip. 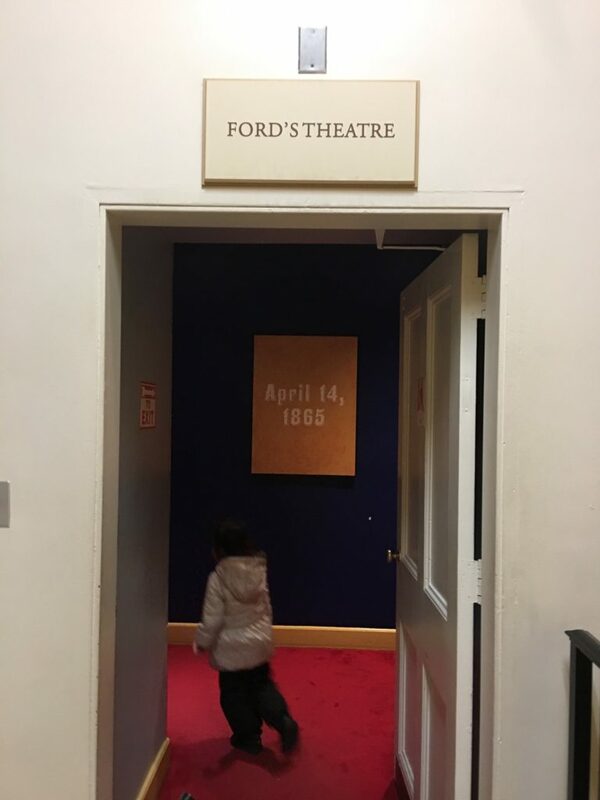 He absolutely loved visiting Ford’s Theatre and even wanted to go back the next day (which we didn’t do because we had so much else to see!). Going inside the visitors center/museum here too. Again, this is all free…which I find shocking because to take my family of six to a local museum here in Dallas will easily be over $100. 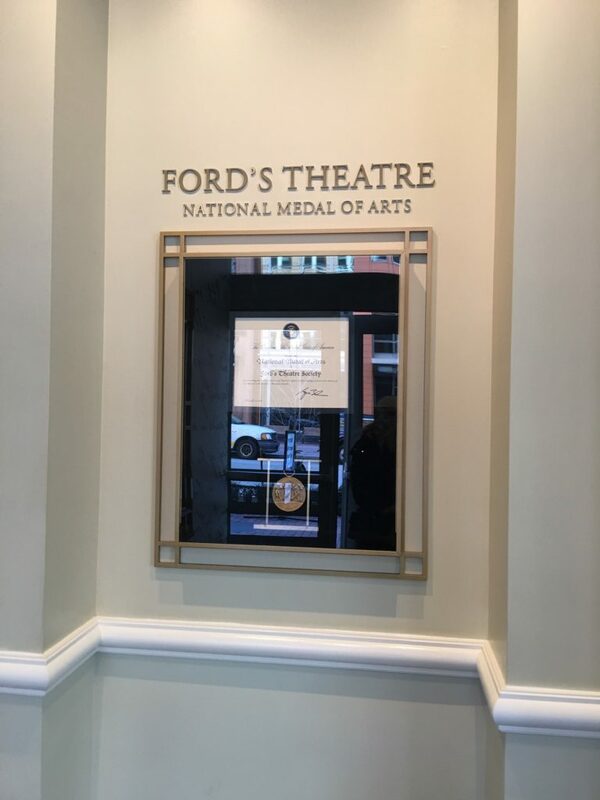 For those of you who don’t know, Ford’s Theatre is where Abraham Lincoln was shot. Miss Madeley is just enjoying the ride 🙂 . 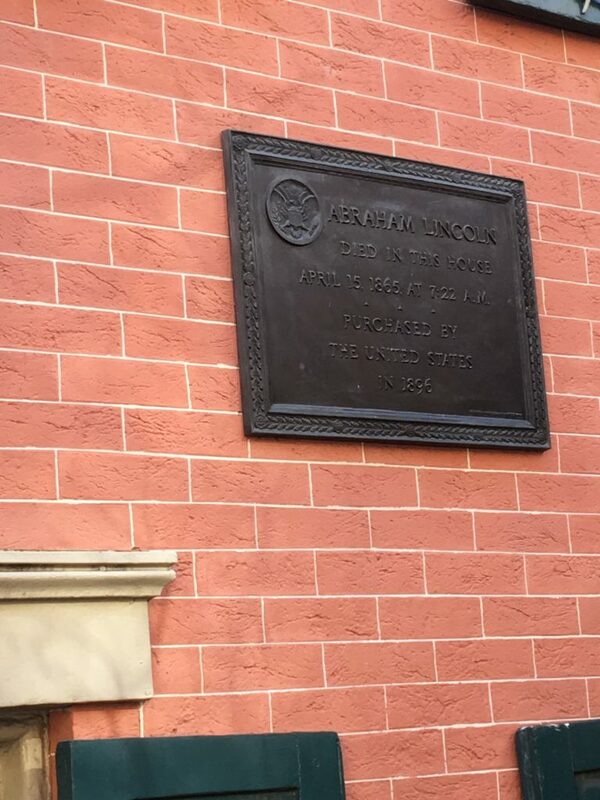 After we left Ford’s, we walked directly across the street to the Petersen House where Abraham Lincoln was taken after he was shot and died a few hours later. Abraham Lincoln died in that very room. To me, it’s crazy to think I was even in a room where Lincoln once was…much less took his last breath. They also had a wonderful visitors center that was really interactive, so we stayed and played/learned after we walked through. …we let them eat ice cream while we decided what to do. Sigh. It’s vacation, right? We can eat dessert first! 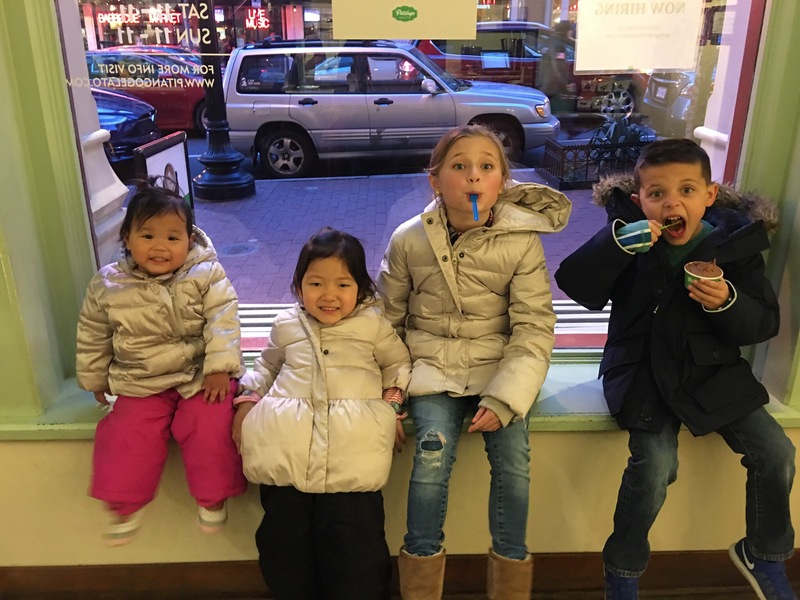 We saw an ice cream shop and popped in and all four kids got a little treat while we put our names on the list next door at Carmine’s (where we eat in NYC…so it was not original but it was convenient and at this point, that’s all we wanted). We were a happy, happy bunch! 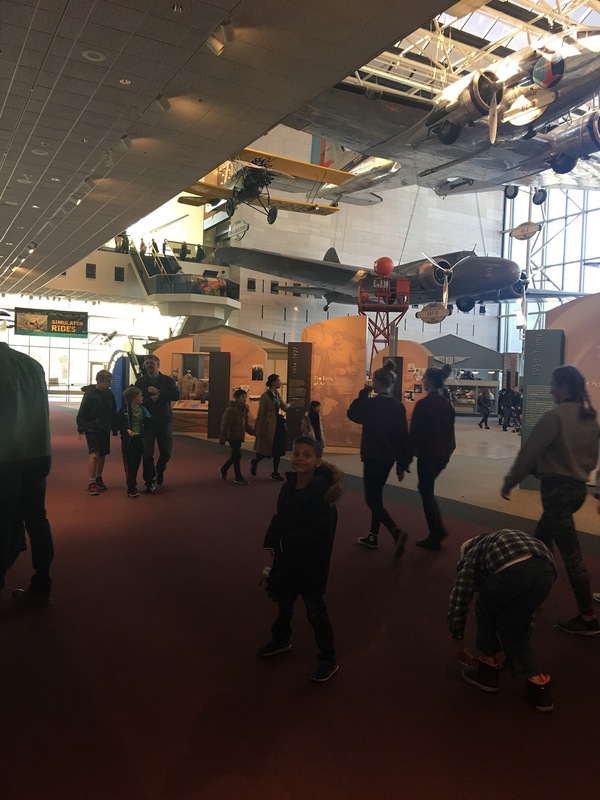 …first stop, the Museum of American History. Once again, it was free and it was fabulous! We spent several hour here and could have stayed longer. There was just so much to see and so much to do! See Kensington on the monitor? She was reading a famous speech and it projected her on the screen 😉 . 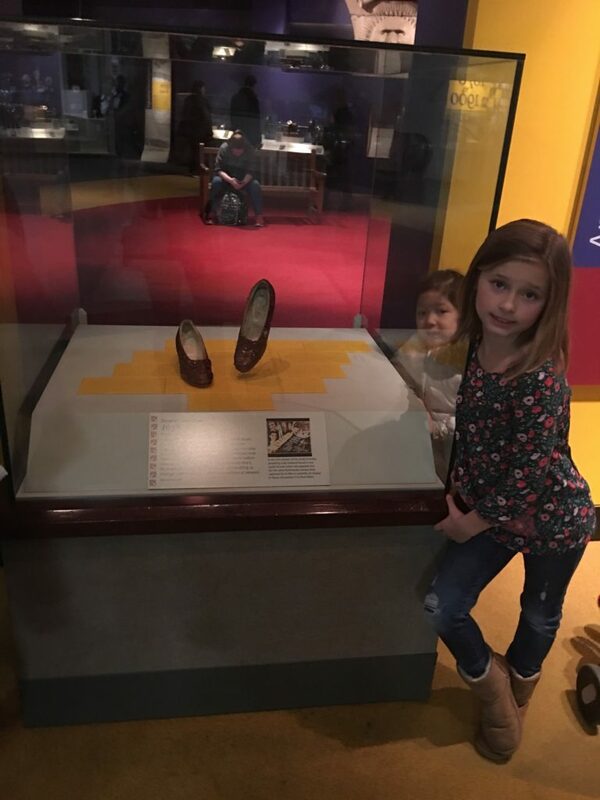 One of the original pairs of ruby slippers from The Wizard of Oz. 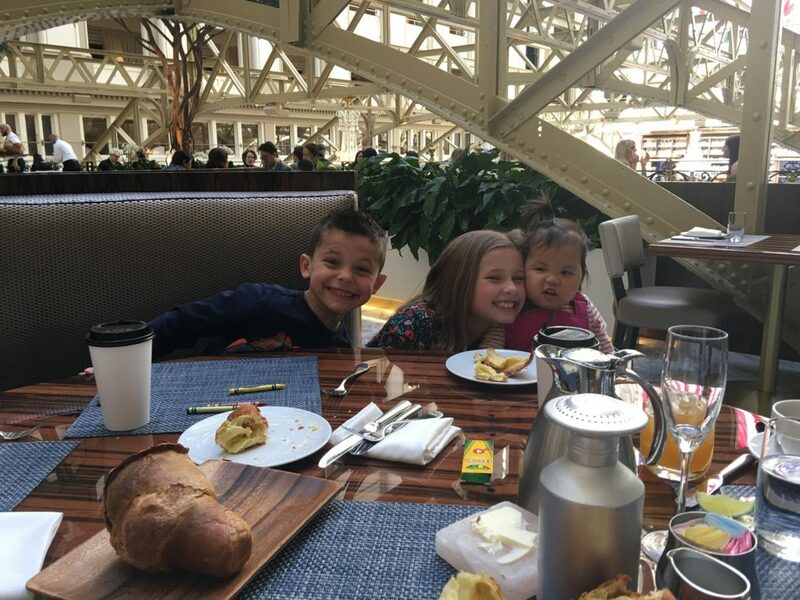 …the Sunday brunch at Trump Hotel. The popovers were out of this world! Coffee, popovers and this guy. I was happy. One of the only pics of all six of us. I always forget to take big group pictures! These two were both asleep (long cozy walks will do it to you! ), so they slept and we headed toward the Smithsonian National Air & Space Museum. We could have spent all day here too. (There was seriously more to do in this city than we had time!) We toured and then we also watched a really cool 45 minute documentary at their IMAX theater on D-Day. Ashby and Madeley woke up and enjoyed that too 🙂 . Love this bunch! We left the Air & Space Museum and headed to the National Archives. Picture taking was soooooo limited in the National Archives…but you should know the thing that we saw that was our favorite was…THE DECLARATION OF INDEPENDENCE. Whoa! So cool!!! And bonus…there was no one there! I guess when you show up at 4:00 PM on a random Sunday in March, there are no crowds. We were able to take our time and absorb it all. Plus, we toured the rest of the Archives, which in my opinion, might have had the most interactive stuff to do until it closed. We had the best time! My kids have seen the movie National Treasure too many times because they wanted to check the back for the map. I’ve watched too much Scandal because I wanted to ask if Fitz and Liv really touched it 😉 . We left and walked to dinner. I had made us reservations at City Tap House and it was delish! 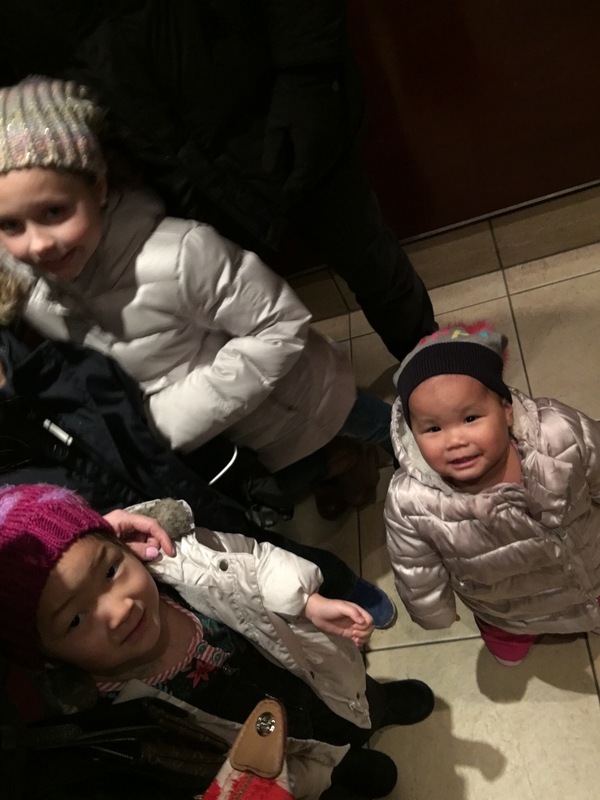 My kids enjoyed it, we enjoyed it…the atmosphere was great and the food was excellent! And then after dinner, when it was dark, we made our way to the Lincoln Memorial. One of our very favorite parts of the trip. Everyone told me that you had to see it at night…and I think they were all right. Some things did not live up to their reputation and were a little underwhelming in person but not this one. This one exceeded all of my expectations. 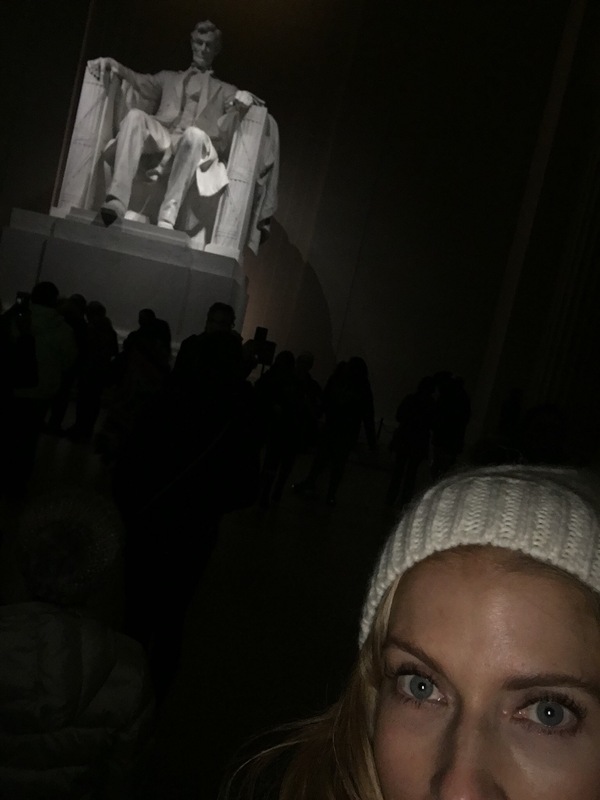 I took a selfie with Abe. My big three taking it all in. I love this picture :). This was just so cool. And then walking out, you look out over the Washington Monument. Having the best time in D.C.! This is why I love to travel. You just have to see this stuff in person. After that, we headed back for the night. It had been a BIG day! How exciting! I’ve never been to D.C either, so it’s good to know that it’s such a perfect vacation spot. Hey there. Glad to hear that you all enjoyed DC. Since I live in the DC metro I need to know the name of the Mexican restaurant that you went to near the White House. Also, can you please share your lip and nail color info in the pick of you at the airport, as well as the gold ring. Looking forward to your second DC post next week. We had the best time Melissa! Okay, the lip is Bobbi Brown’s Taffeta, the nails are Essie’s Backseat Besties and the ring is Tory Burch from Nordstrom :). Got it! BTW-I’ve been the Lincoln Memorial countless times, but never at night. It is now on my To Do list. Hope you made it to Theodore Roosevelt Island and Great Falls. I guess I’ll find out next week. Thanks a bunch. I live here in the city — my guess – Rosa Mexicano?? Thank you! We are going to D.C. next month for a Spring Break trip with our kids (5.5 and3). I am a bit overwhelmed by everything there is to do. Your post is a perfect way to help me narrow it down. I am excited to read about part two of the trip! So fun! I go to D.C. each fall with our 8th graders for their class trip. The view of the Lincoln, Jefferson and Washington monuments at night is one of my favorites! I love how clean and walker friendly the city is. The Holocaust museum is great, but perhaps too intense for your kids. D.C. is such a great trip!!! We took our oldest when he was 6 & have been back again. You never feel like you’re there long enough … there’s sooooo much to do! & yes! Mostly FREE! This makes me want to go to D.C.!!! Yay!!! 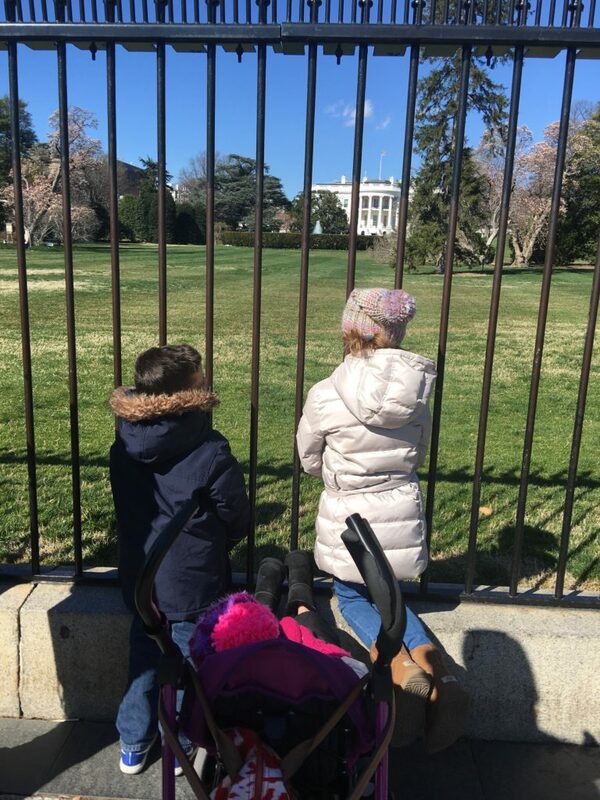 Love D.C. but haven’t taken the kids there yet. Definitely on the list! Holocaust Museum is a favorite but all those monuments and museums are amazing!!! How amazing it is that the kids get to see so many things so young! I still have get to visit Washington DC myself! Did you see the new Smith in DC? I live in the suburbs of the DC area and work in the city. When I started working up here, I decided I should take full advantage of walking around the sites during my lunch hour. When it’s too hot, sometimes, I might pop into a museum if it’s not super crowded. When my kids are little older, I look forward to bringing them up for little weekend outings / school trips. We just took our 3-year-old son to his first live production at National Theater (not far from Trump Hotel and Warner Theater) this past weekend, and we’ve made a trip to the U.S. Botanic Garden a yearly tradition around the holidays for their train display (free). We were there in the fall with our boys who are 9 and 12. We loved every minute of the whole trip. Now when they see coverage of sports/news from DC they say “we were there!”. Traveling with our kids and making memories is my favorite. We are heading to Boston this summer!! Already have tickets for Fenway. DC is one of my favorite places to visit! Looks like such a fun trip! One more thing — Have you heard of Free Tours byFoot? They have folks in several cities that will provide various types of walking tours, and you basically, pay whatever you can afford or think it’s worth. There is no set price. We’ve started reserving tours in different cities, and have enjoyed them. In NYC, we did a tour of Soho, Chinatown, and Little Italy. 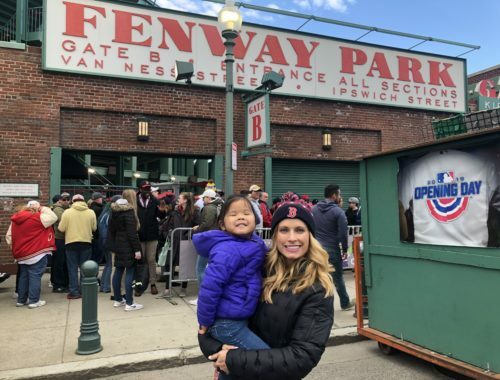 We took my mom to Boston recently, one of our favorite cities, and did a tour of the North End / Little Italy, and then in Philly, we did an Independence Mall Tour (we were only there a couple days and were short on time–husband had never been). Each one was about 2 hours. Usually, I just buy a book about the city, research on trip advisor, etc., and tour the city on our own, BUT it is nice having a tour guide that is passionate about their city, enjoys sharing the history, as well as their perspective on things (food!). Fascinating – would not have expected the trip to be to D.C.! We live 20 minutes away in VA so I love to see what spots stand out to people on visits. Glad you enjoyed and will look forward to reading the rest! Love D.C.! I went to college there, and I’ve been back a few times with my kids. 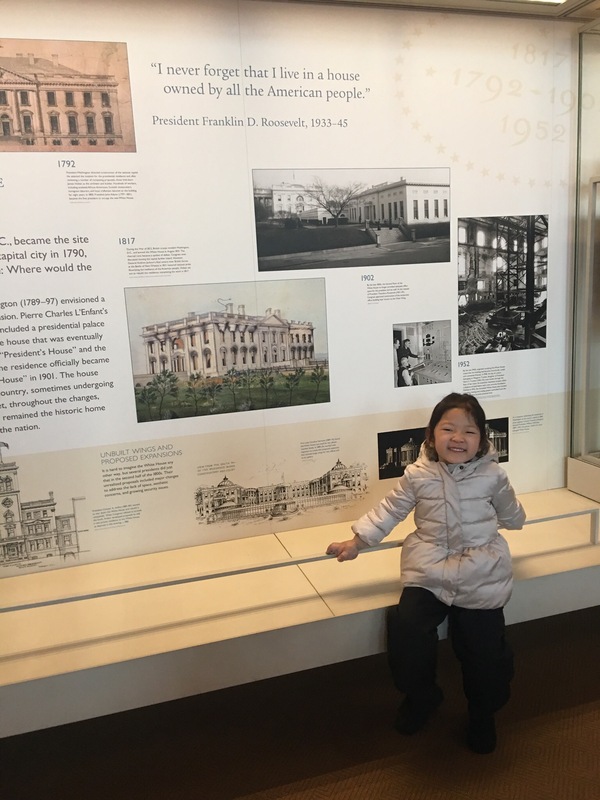 There are so many great things to do, a personal fave with the little ones is the National Building Musuem. Looks like you guys had so much fun! 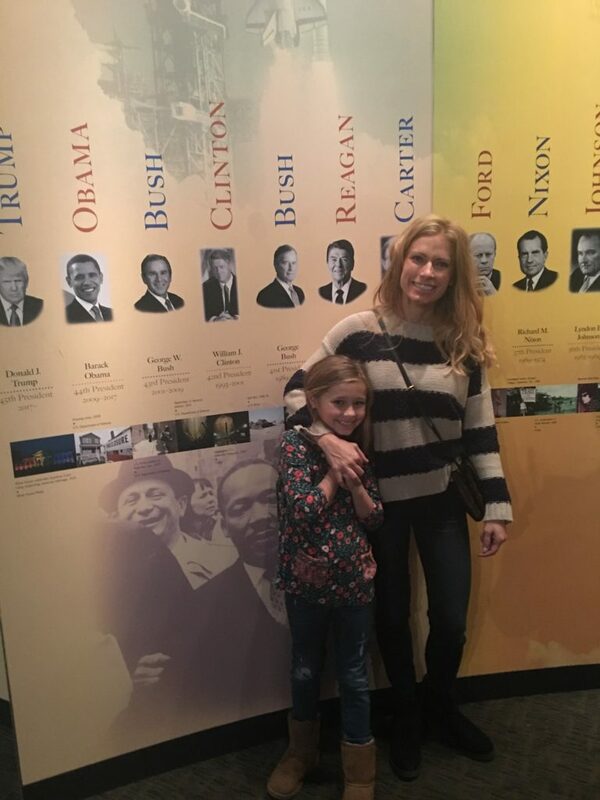 We lived just outside of DC for four years, and loved being able to take the kids on the metro and pop into all of the different FREE museums on the weekends. I miss that! Our favorites were the Air and Space Museum and the Natural History Museum. Looking forward to part 2! Thank you so much for sharing this perfect vacation! It is my dream trip and now for sure I know we are going! I want to be there in the preceince of so much History. So much good info!! Question about how you got around the city with young kids…..did you mainly use the metro? Or walk? We want to take our 3 kids, but the transportation idea intimidates me a bit. Thanks for all the great ideas you shared! We walked about 99% of the time! Meg, D.C. is pretty small. 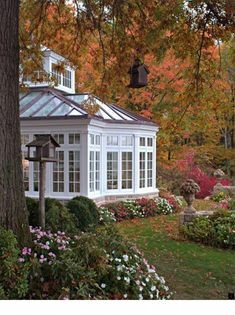 And the things you would want to do are all in neighboring areas, so walking is great. If you do need to use the Metro it’s not a problem. It’s smaller and MUCH less complicated than NYC or London. My parents use it with ease when they come and that’s saying something! Funnnn!!!! What a fantastic trip!! I went to DC in 2009 with a friend and went to almost all the places pictured! That’s great to know your kids enjoyed it! Now that I’m a mom of three, I’d love to take them when they’re a bit older! I loved DC and agree that it was super convenient getting around, the food was awesome (we went to almost every cupcake shop while there hahaha) and the transportation was perfect!!! Glad you enjoyed visiting my city. I’m not sure if this will be included in post #2 or if it was too cold for you guys to visit, but the National Zoo is also free! 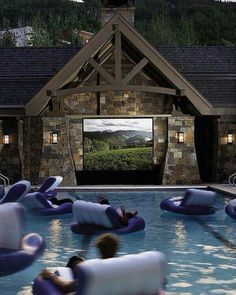 An idea for next time! Same with Arlington Cemetery which is worth walking through in my opinion. It always leaves me in awe. I’m assuming you stayed in the Chinatown area near the Verizon Center, and if Rosa Mexicana Jd the spot you ate lunch, then yes, you found the very best guac in the city. Also, letting your kids eat ice cream before dinner is one thing, but letting them have Pitango gelato should seal your spot for Mom of the Year!! So happy you all enjoyed D.C. so much!!! Ok you are making me add DC to our list!!! This sounds and looks like such a great family trip! My son just learned about Abe and has been obsessed as well, he would flip over all the stuff to do there!! This post makes me SO HAPPY! I was born and raised in the suburbs right outside of D.C., so I consider DC my hometown. I love to hear of visitors loving and appreciating it as much as I do!! Though, I must admit, living here the past 25 has made me take it for granted for sure :). I don’t play tourist hardly enough, but this post has me inspired to be a tourist in my own city! Come back and visit us again soon! There so much more to see!! Yes! We live a short drive from D.C. and went in the fall with our (then) 9 month old… it was amazing! Everything was free, and everywhere we went was super accommodating to us. I don’t think I walked into a single place (museum, restaurant, hotel) without them asking if I needed anything for the little one. Amazing trip! We also didn’t hit any lines (mid November). We can’t wait to go back!!! 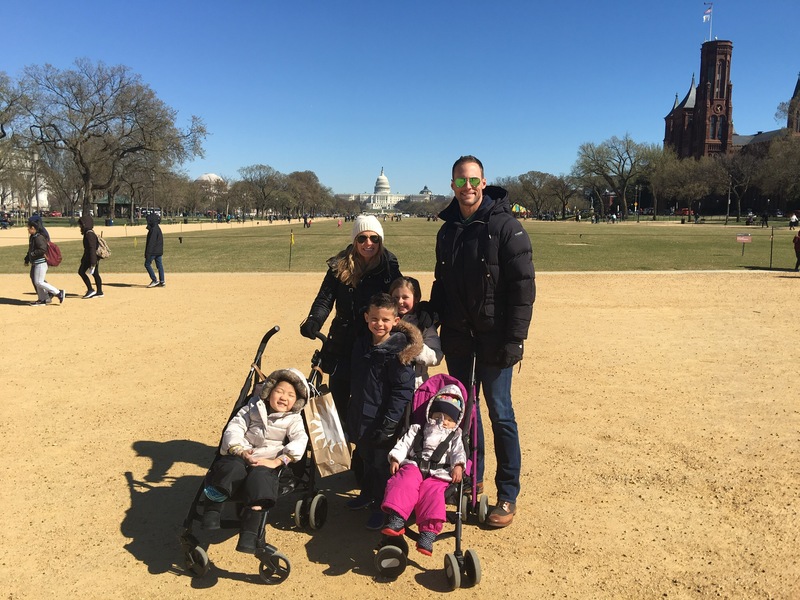 How crazy…we took our kiddos there last week for spring break too!!! We did the same things and loved it too! We must have just been at the museums/monuments on different days ? We will definitely be going back! Whoa!!!! I loved this post!! So much fun seeing what people do on vacations. 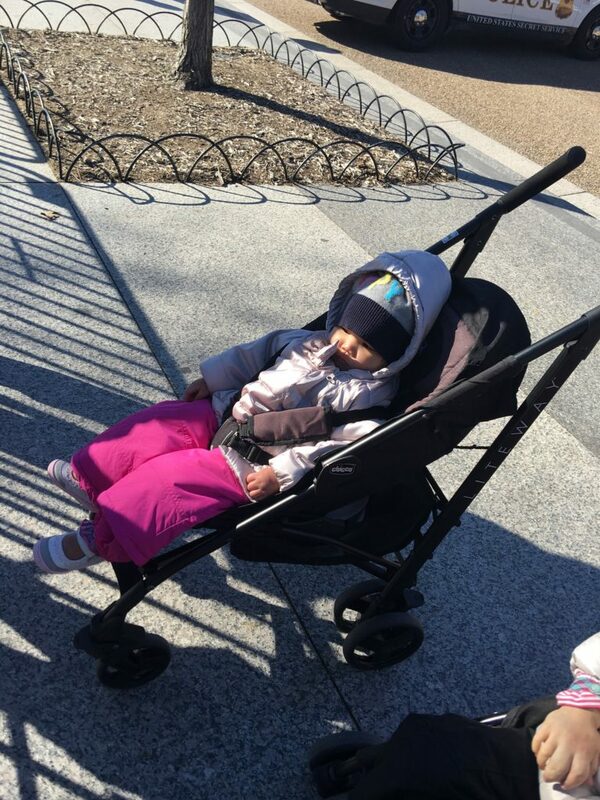 Madeley managed to look so cozy and warm in that stroller. Who knew there so many free things to do in DC?! I can’t wait for Part Two! As a D.C. area native, it was cool to see what places stood out to you. Please mention to potential visitors that it is stand left, walk right on the stairs for the metro. Super important if you want locals to remain friendly. ? What was the name of the Mexican restaurant? So true!! 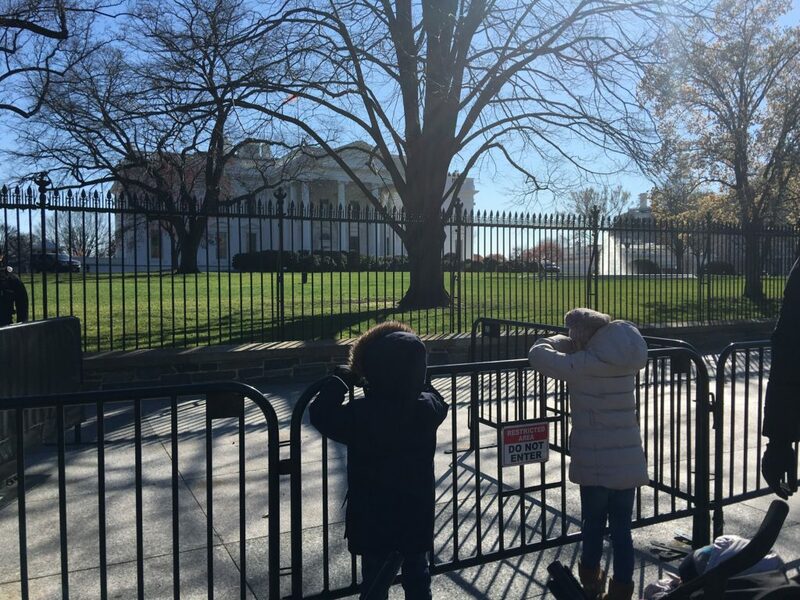 We used to live in DC, and just took our kids back for their first visit, and it’s easy to tell who the tourists are. They stand still on the escalators! What a fun trip!! All of the pictures are awesome! Love all monuments lit up at night!!! So pretty! Love love love it!!! I’m so glad you guys had fun! The Ruses miss D.C. very much❤ I think most people don’t realize what a great place it is for families. I’m so glad you’re posting so many pics! So glad you guys had a great time in DC. Growing up in the DC area you take the city for granted. We rarely go into the city to become tourist until we had kids. They love it when we go down and just be tourists for the day. Glad you had a wonderful spring break! I cannot remember! Several people are commenting though and they think they know which one it is! Outstanding! Side note- Smith would likely LOVE Mt. Rushmore here in South Dakota! One of my bots has been asking to go to D.C. lately so it is on our list. 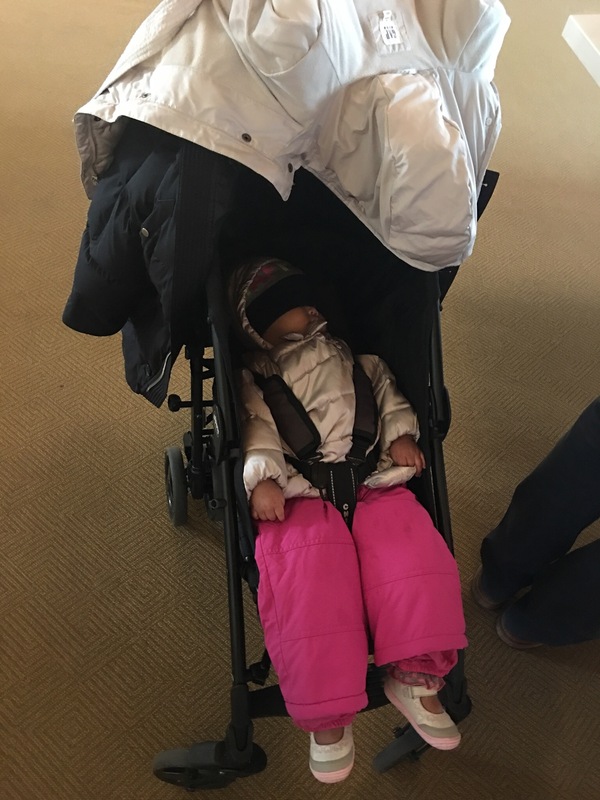 Your tip about the snow pants for the stroller is GENIUS! We always pack a little blanket but it is constantly falling off of a lap and getting run over and stuck in the wheels. Adding this to my mama bag of tricks! D.C. is such an exciting choice for the kids! 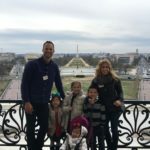 I was just talking with my sister recently about waiting to travel to D.C. until we have older kids. It seems like you guys really enjoyed the first part of your trip. Can’t wait to see the rest! Oh wow, looks like an amazing time. I absolutely LOVE D.C. too! The last time I went was with my husband before we had kids, and now I want to go back with my kids someday. 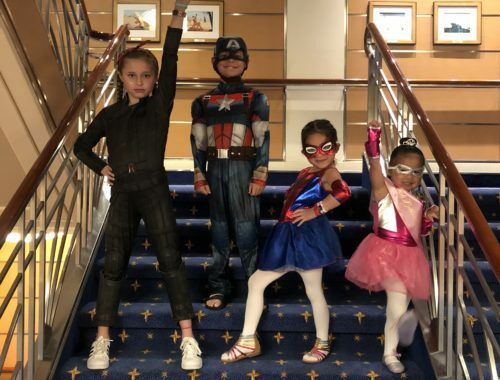 Thanks for sharing your vacay pics with us!! Planning on seeing DC in June- thank you for this post. Author Louisa Mae Alcott’s sister taught David Chester French to sculpt. He created the Lincoln Memorial and buried his first sculpting tools at the foot of Lincoln. I learned that bit of trivia when I visited Alcott’s childhood home in Massachusetts. Thought you might enjoy knowing it. Glad you guys enjoyed DC, we live not very far from it. It’s got so much to offer. Hopefully you were able to take a trip to visit Georgetown Cupcake, so delicious!!! I am so excited that you are posting this. I emailed you a few week ago about our Spring Break and didn’t want to spend the money on a cruise. So, we are going to DC. We are driving from GA, so we are stopping for a couple days in Williamsburg. We will have much larger crowds going on April, but we are really excited. I just got on the list for a tour of the White house and the capitol. Can’t wait to see the rest of your trip. My kids are a little older. My youngest is about Smith’s age. I loved reading about your trip to D.C.! I am going next week! I am so excited to see everything in person!! How far in advance did you call and make reservations to restaurants? I always use http://www.opentable.com! So easy! DC is my happy place! I lived there for a semester in college and did an internship at the National Archives. I was there for 4 months and still feel like there was more to see! You are right about the pros of this city; the metro is always clean and almost everything is free! Thank you for this! It is on our family’s MUST-DO! Can’t wait to read more! I visited Washington DC as a teenager with my grandparents & hands down it was my favorite trip! My husband & I have been talking about taking our 5 year old! Sounds so fun! I love Washington D.C. and only realized recently that all the Smithsonian museums are free. My husband and two boys 5 and 8 went this past April while I was 7 months pregnant. 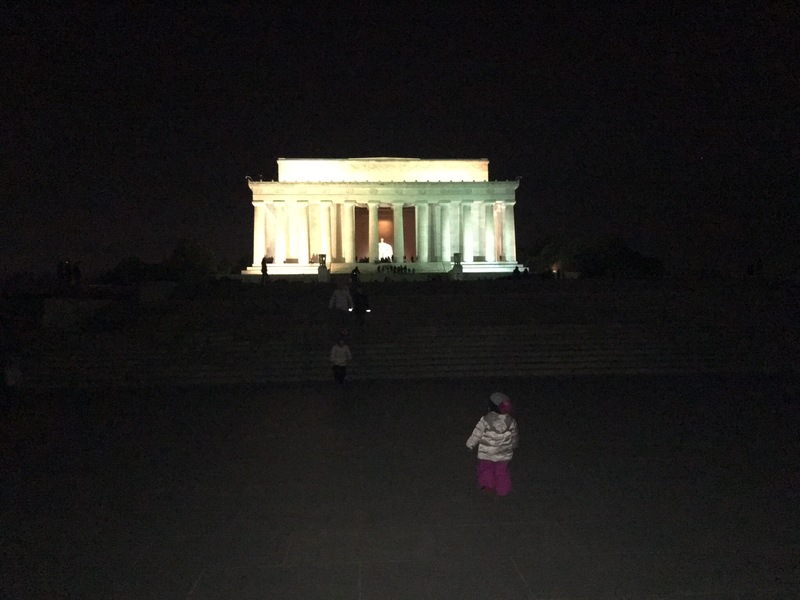 We only went for one day/night and decided we wanted to visit the National Mall. It was so much fun. Tips for anyone else going: There is a bus called the Circulator and it has many different routes around Washington DC. There is one route that only goes around the National Mall. It’s one dollar per person per ride and it’s so convenient if you don’t want to walk everywhere. Also food down there is more expensive than normal so be prepared. We got down there early in the morning while it was still dark and watch the sunrise over the memorials. We were able to walk to many of the memorials and museums in the morning and early afternoon and get to our hotel before the rush-hour traffic. Traffic can get pretty bad down there so you either want to use public transportation or go when it’s not rush hour. 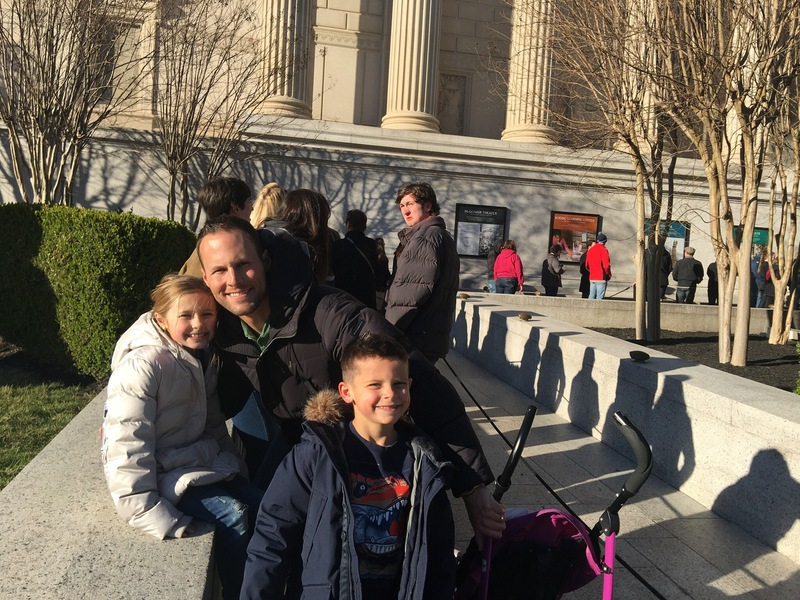 D.C. is an awesome place to take kids….we’ve been there several times and you’ve shown me more places that I want to see…. I loved seeing this and all of your suggestions. We are taking our kids (9 and 11) next week for their Spring Break. Hoping you post the rest on Monday or Tuesday so I can get some more ideas. 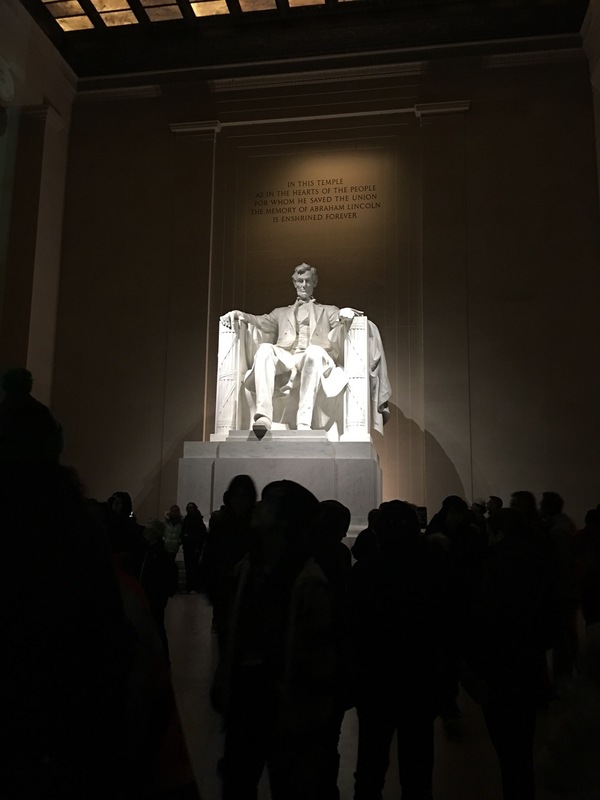 😉 Loved the suggestion to go to Lincoln Memorial at night! We will be snagging that one! Also totally forgot about Ford’s Theater. We are So excited to be taking them!! Thanks for sharing! I love all the pictures! DC is definitely a bucket list trip! HI! I love reading your blog. My husband and I took our yearly anniversary trip to D.C. last September and also had a WONDERFUL time! One fantastic place we “discovered” was The Anderson House on Embassy Row near Dupont Circle. Even my brother, who visits D.C. quite often, had never heard of it. It really is a hidden gem and quite historic and beautiful. It is maintained by the Society of the Cincinnati, and is definitely worth a visit 🙂 You are so right though, we were there a full week and still had so many things we didn’t get to do! Such a fun family vacation! 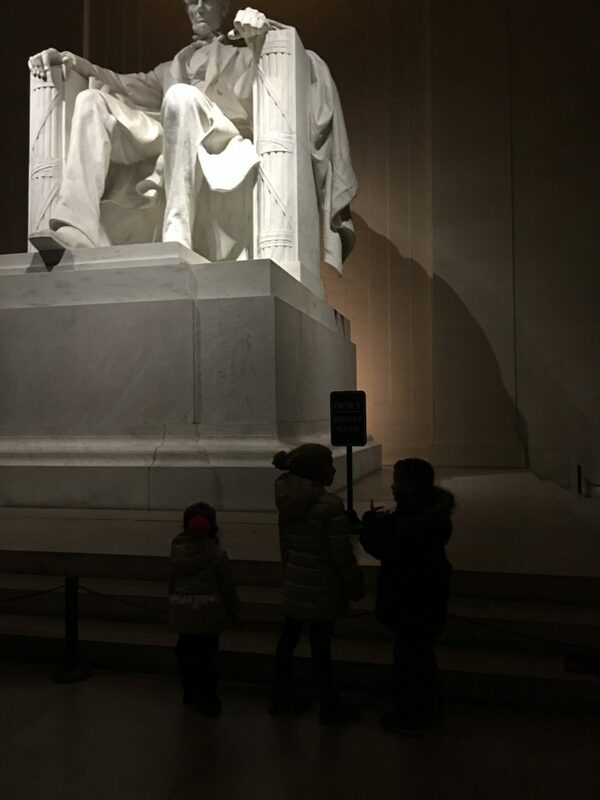 I visited DC for the first time as a grownup and loved it, and we have been blessed to take our children twice at different stages and it never disappoints. We love the museums, the monuments and Georgetown! As a Baltimore native, you definitely came at a great time. The Cherry blossoms will be out soon which means everyone will be in DC all the time. Great timing for a visit without a lot of people! We are thinking of going to DC (only we are in the Philly area so not too far to drive!). Wondering if you could let me know where you stayed through Air Bnb….we are a family of 5 so we love to stay in these kinds of places too! 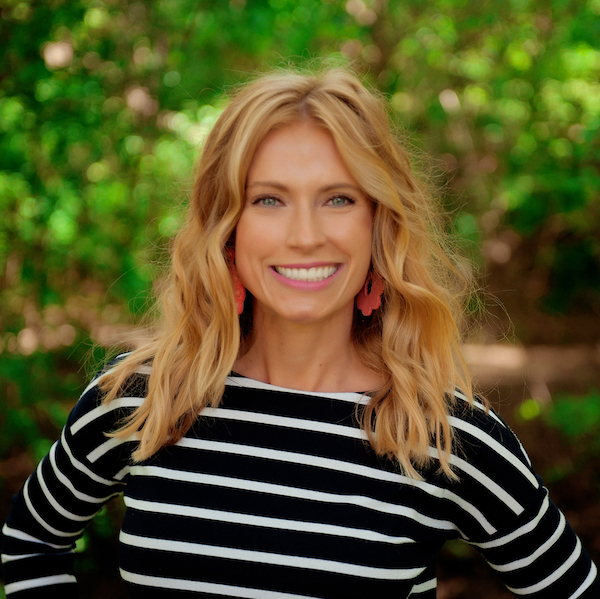 Email me and I’ll be happy to share! Ha! I’ve lived right outside of D.C. my whole life and my parents would take my sisters and me there every weekend because everything is so fun and FREE ? 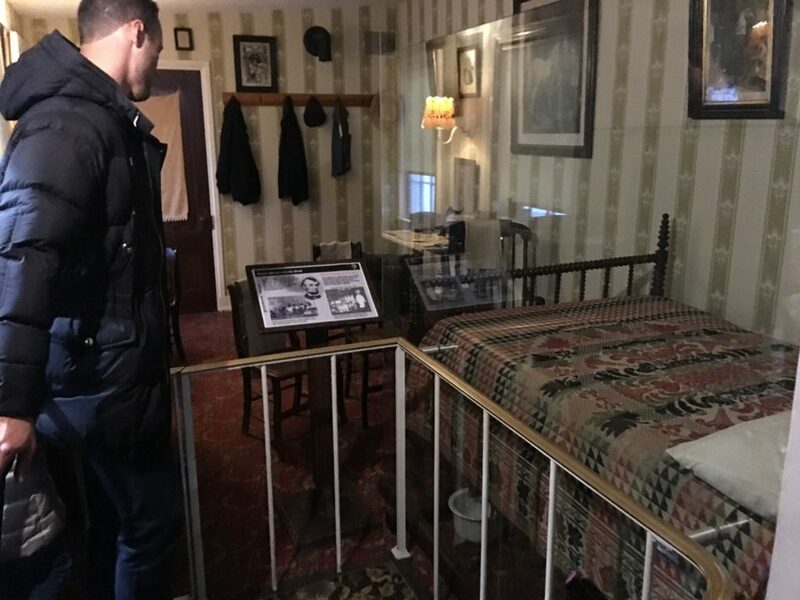 My very first field trip in elementary school was to the Petersen House and I felt the exact same way standing in that room! Wish I would’ve run into you that weekend but also glad I didn’t because I probably would have embarrassed myself fangirling. ? Glad you had fun!! When I was in elementary school, my family had good friends that lived in Alexandria, so we went to DC for a couple trips. What a great city! It was always our 6th grade’s class trip yearly, and that was fun too, I really wish though it was a trip we would take in high school, as I think I would’ve appreciated it more. Haven’t been back since middle school, but now that I live about 4.5 hours away, it’s on my list! 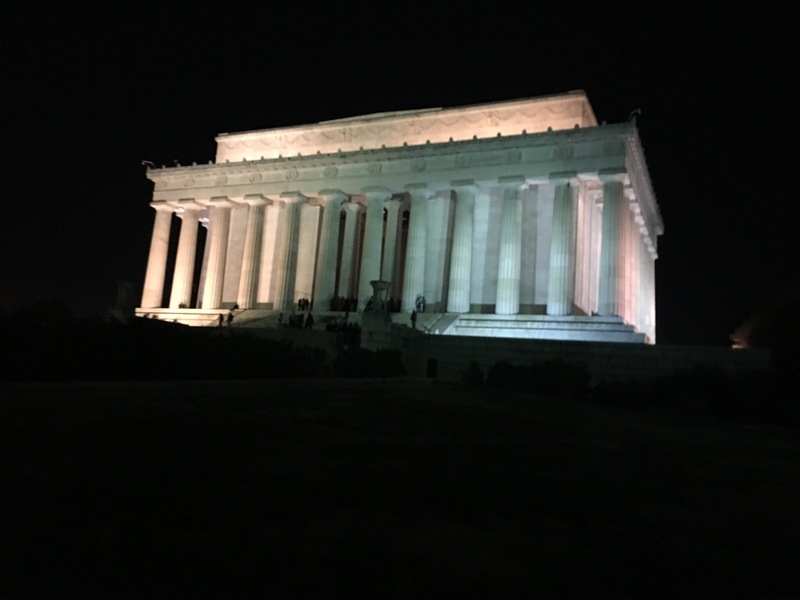 If you plan another trip, here are some spots I’d recommend if you didn’t hit them this time: The awakening, Union Station (OMG the international desserts…) Bureau of Engraving, White House Tour (if open), and obviously all the Smithsonian’s! Another interesting place, but maybe not young child appropriate, is the Holocaust Museum, definitely a darker subject manner, but if you enjoy history, it’s done very well. Hope you had a great time!! 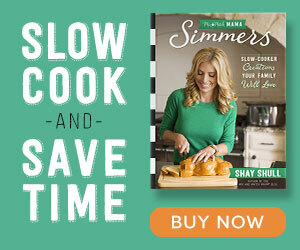 If you don’t already have it, you should get this book for Smith. It is a neat little book and series. He has done books on all kinds of historical and some modern day figures. I highly recommend them! I love DC! I was stationed at Andrews Air Force Base for technical training for three months and my husband and I were married not far from there, can’t believe that was nearly 15 years ago! I spent almost every weekend in the city, we would take the train into the city and go until our feet begged us to stop! 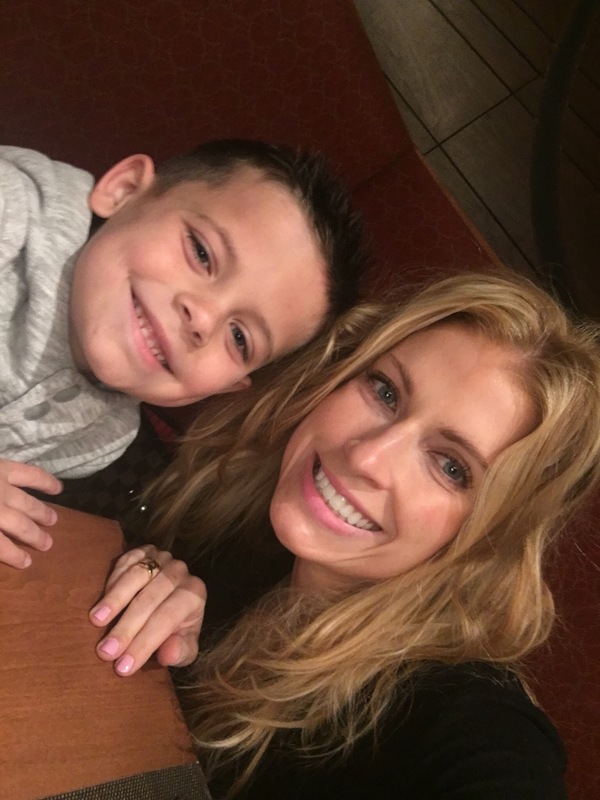 I have always said that I wanted to go back and have just been waiting for the right time with our two children. 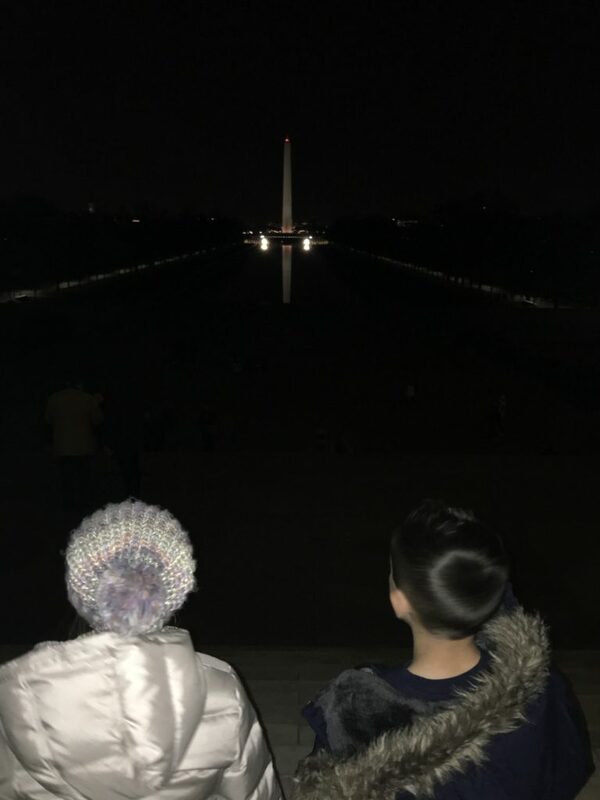 Our son (13) is an American history buff and our daughter (9) learned about the National Mall earlier this year and has asked to see it all in person, so we feel like it is finally time. I can’t wait to read about the rest of your trip! Looks like so much fun!! Who knew D.C. could be experienced for free!?! I sure didn’t!! Love all the pics!! Looking out the window at the Washington Monument from my office right now! Glad you enjoyed it! What is the name of the Mexican place you loved? We took a family vacation with my parents over 10 years ago to D.C., I want to go back so bad! It’s one of my favorite places! So excited you posted about DC. My husband just returned from a year long deployment and we leave for DC next Thursday. We have never been there. We are attending a ceremony as our unit won the highest volunteer award for the Army Reserve this year. We will be going to the Pentagon Hall of Heroes for the ceremony. I can’t wait to read your second post so I can learn everything we should do during our 5 day stay in DC. Please post by Wednesday!!! As a DC resident, it makes me SO happy when people visit the city and love it. It is definitely budget & kid friendly and you guys picked the perfect time to check it out! Sorry you missed the cherry blossoms! So glad you had a great time in the city I love and live in! As a resident, I forget how much there is to see and do, so it was fun to read your post today! I don’t take advantage of it as much as I should! Although I live in DC, my in-laws live in Prosper, TX and we’ve visited your town many times too! Love the McKinney Town Square. We were there the same weekend! It was freezing cold but at least blue sunny skies made up for that. 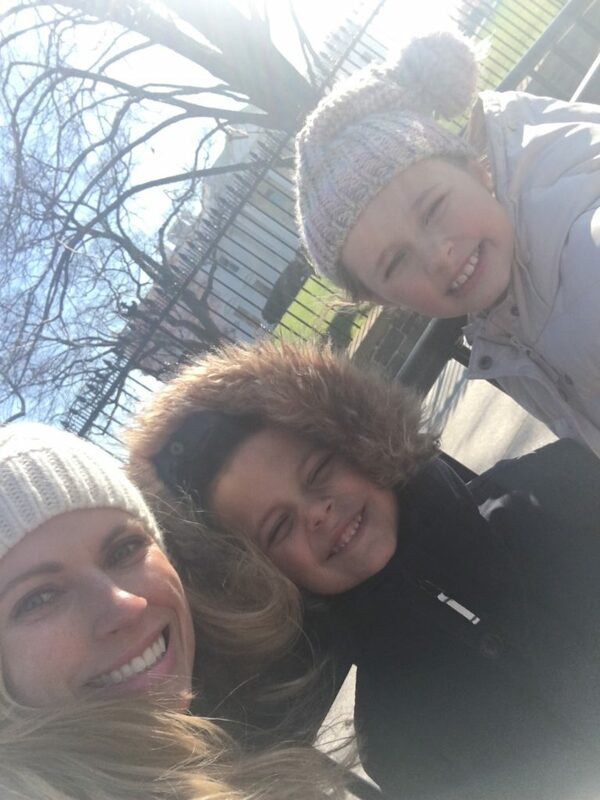 D.C is one of our favorite spots for a fun weekend trip! Lots to see ? Would highly recommend a Senate or House of Represenative session or a Supreme Court hearing! D.C! My backyard- Winter is great because most of the city is indoors but when its nice you can still see all the monuments at night. Super healthy city (all that walking!) and going into places for FREE?! The. Best. You should try having your kids mail letters to the White House. Most of the time they send a note back! What a great trip!! We are looking into going there for Fall Break! So fun! I lived in DC for a summer – and even then, I still left feeling like I hadn’t seen everything. It’s such a great city! Love D.C.! I’m a college student there now and am obsessed with the Kalorama neighborhood, it’s the best for running and walking. 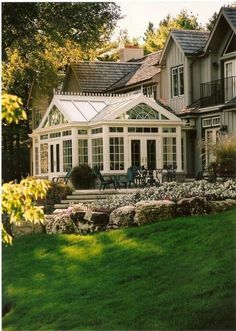 It’s so beautiful, and both Ivanka Trump and the Obamas live there. Did you make it there? Hi Shay! You may have answered this before (in fact I am sure of it lol!) but! 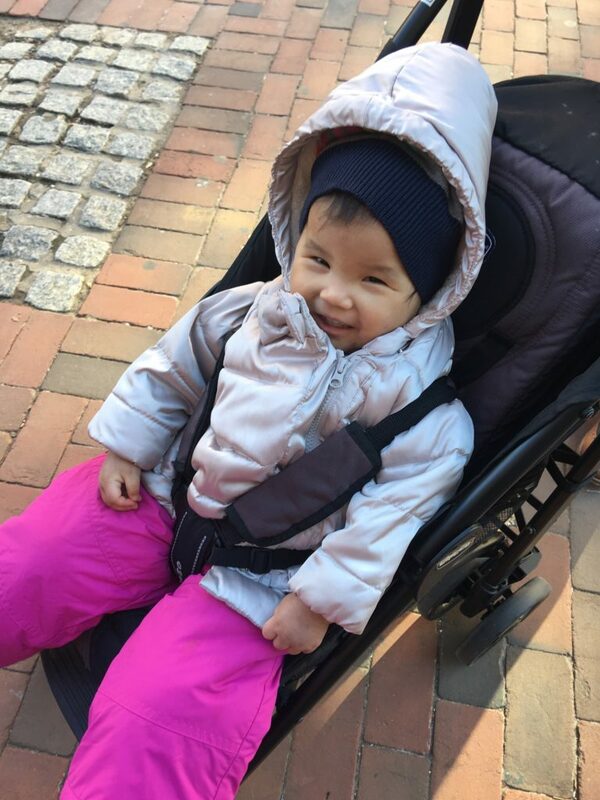 I cannot remember the answer…what strollers/brand/model do you love the most for these kind of trips!? We are heading out for Spring Break next month and need one for our youngest (who happens to share the EXACT birthday (date and year) as Miss Madely) 🙂 Thank you in advance!! They’re Chicco Travel Lite (I believe!). I love Washington, D.C. I saw A Christmas Carol performed at Ford’s Theatre a few years ago. That was a really fun experience. I love seeing all of those familiar places through your eyes! How would you adjust your plans for an adult only trip? Suggestions, anyone? Hmmm….I actually wouldn’t change much if anything for adults only. All of it is still fascinating for adults…and probably more so for adults than kids. All of the Smithsonian is good. I’d say just adjust for your adult interests. If you like art, definitely go to the National Gallery of Art, either the East or West Wing depending on what era of art you enjoy. The Capitol building, Library of Congress and Senate/House session would definitely be more adult oriented and fascinating. Enjoy!!! 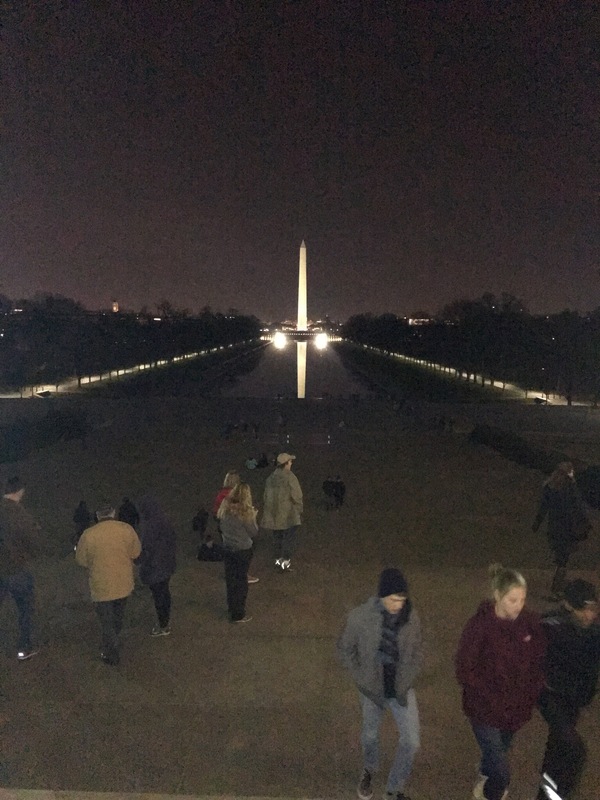 I work in DC, so glad you had a blast seeing all the sites! I may also have bummed I didn’t run into you. What a great trip so far. Glad to hear that it is sooo family friendly. Looks like a great trip! Are you still planning on doing a post about how you plan your trips in advance? I’d love to know your tips and ideas! Yes!! It’s on my “to do” list!! Oh how fun! DC is fantastic! I was there as a teen, then went again in 2009 with my husband and 17 year old daughter. We were there for five days and couldn’t fit it all in, there is so much to see! 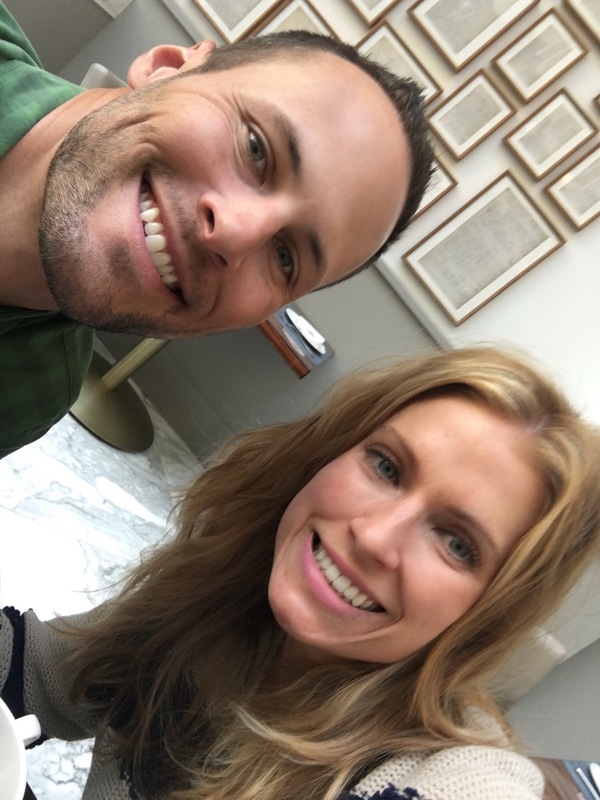 My husband and I are going back to DC this coming Fall so I’m very excited to see your posts about what you saw and where you ate! 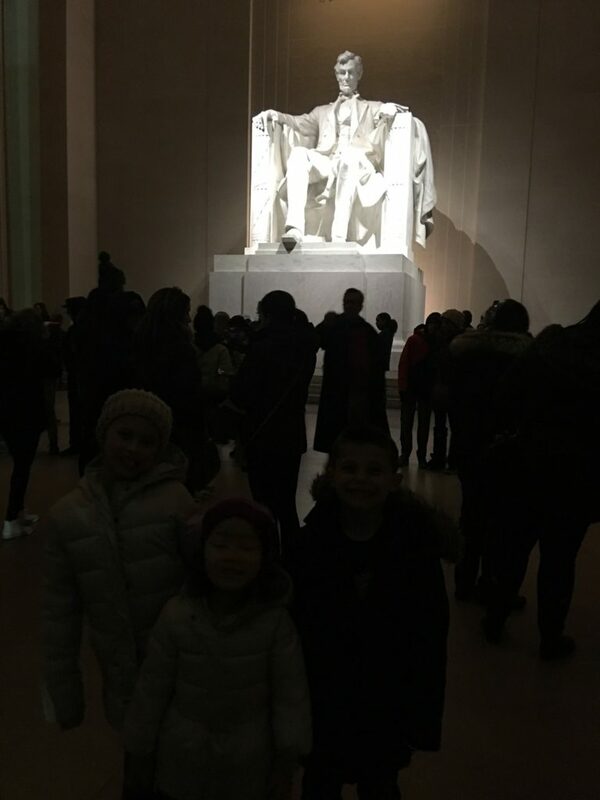 We also saw the Lincoln Memorial at night, what a sight! You guys squeezed in SO much in just the first couple of days! I went to DC back in 2010 for the first time and everything was completely overwhelming. It was just so flipping cool to see all that history. And I’m not even a history buff! Look into the JJ Cole stroller bundle me toddler covers! 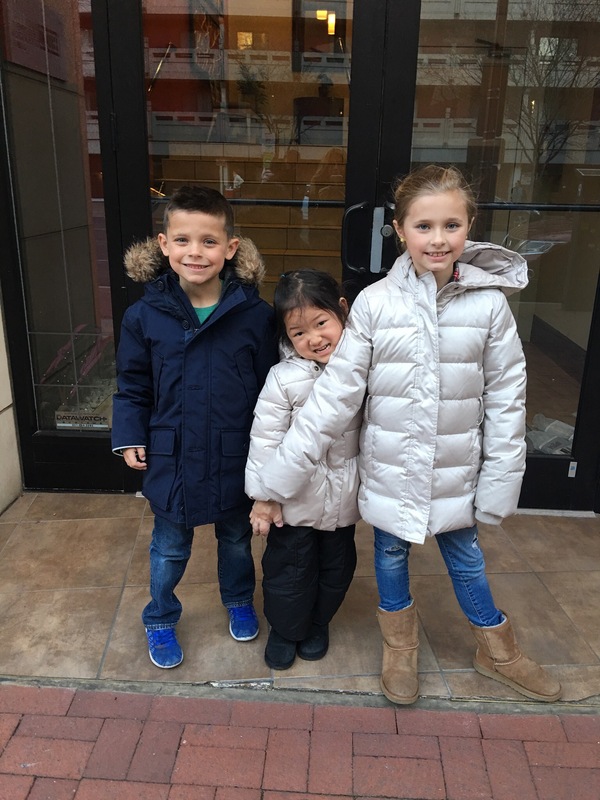 They are simply amazing for cold weather and little ones! I bought my Uggs true to size just like my other ones (I wear an 8 and bought an 8). If you’re a half size, I’d probably go up. And it’s Bobbi Brown’s Taffeta :). Hope you got to see the Awakening statue, the kids would love it! Your trip looks amazing!! I haven’t been there since high school but would love to go back with my daughter someday!! Question, do you take a backpack or a diaper bag with you for the kids? I saw you wearing a small crossbody bag but when we went to Chicago with my 4 year old daughter I had to carry a huge purse in order to fit what I thought we’d need. It was in December so whenever we went inside all of the hats and gloves and scarves had be stuffed in my giant purse. And that was only 3 of us, what do you with all that stuff for 6 people!! I take a big tote that I hang on the stroller the whole time. I live near DC! I wish I was able to run into you guys. I’m so happy to hear you had a great time. The museums are endless here. I hope you guys were able to visit the National Museum of Natural History. One of my favorites. Looking forward to reading part 2!! What a fun trip! Tim and I want to take the kids so bad. Good to know its kid friendly. I’ll be calling you when we are planning our trip! I was in D.C. this past week too!!! 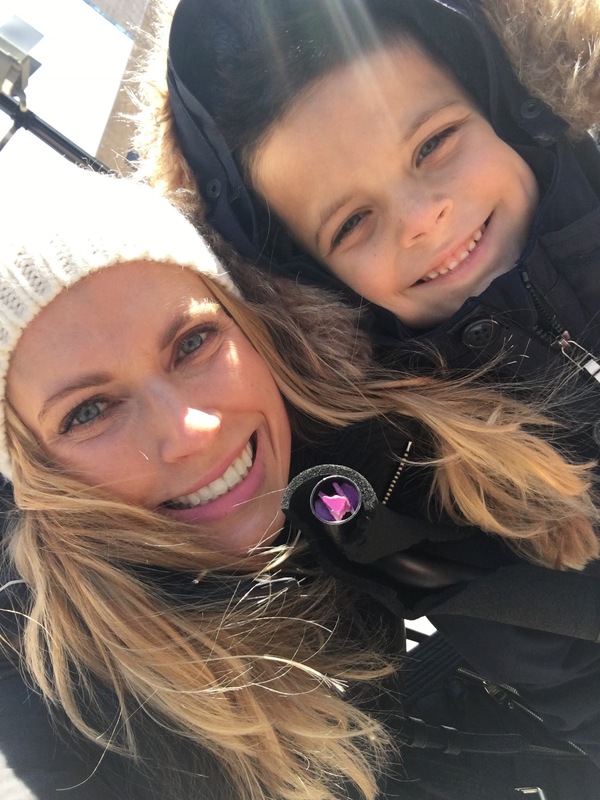 Such a fun city to explore and so much to do… it looks like you guys really made the most of it! 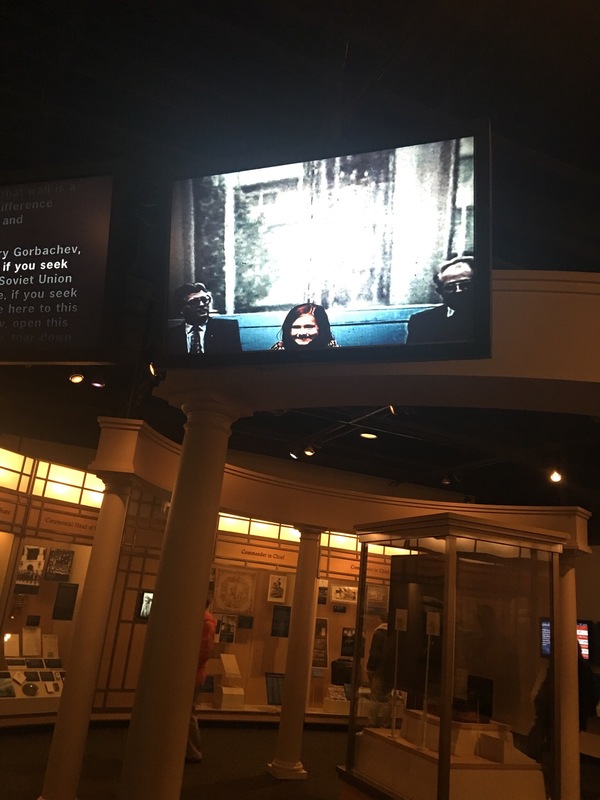 Did you have a chance to visit the Newseum? I know it’s hard to get it all in, but one of my favorite spots. Debbie! You are adorable!! It was such a pleasure meeting YOU! We are planning to take this trip with our crew next year, so I’m so excited to have your insight! How wonderful that there are so many free things to do! So glad you guys made this trip! It’s interesting to me to think about places in our country that I’ve been to a few times, as have most people I know, but people in other area don’t really go to. I’m in Ohio, grew up here, and D.C. is about 6 hrs away, so it’s a trip a lot of people do. It’s a beautiful, amazing city. You can’t help but be proud, appreciative, inspired, and hopeful while you’re there. Oh yeah – we love the National Treasure movies, too…wehave a copy of the Declaration on our family room wall. My husband and I still joke that we stole it and our kids (15 & 12) think we’re JUST hilarious! ? I love that you came to DC! I’m in Richmond VA and have probably not appreciated how “spoiled” I was growing up so close. My husband and I were there on March 4th (like you!) for a Capitals game with friends and as an upstate New Yorker he said “Isn’t it crazy that you can just drive a short bit and be here in the nations capital? !” And I’m like… no, it’s totally normal, what are you talking about? haha. Can’t wait for round 2 of your trip! So glad you enjoyed DC! I live here and have two small children. 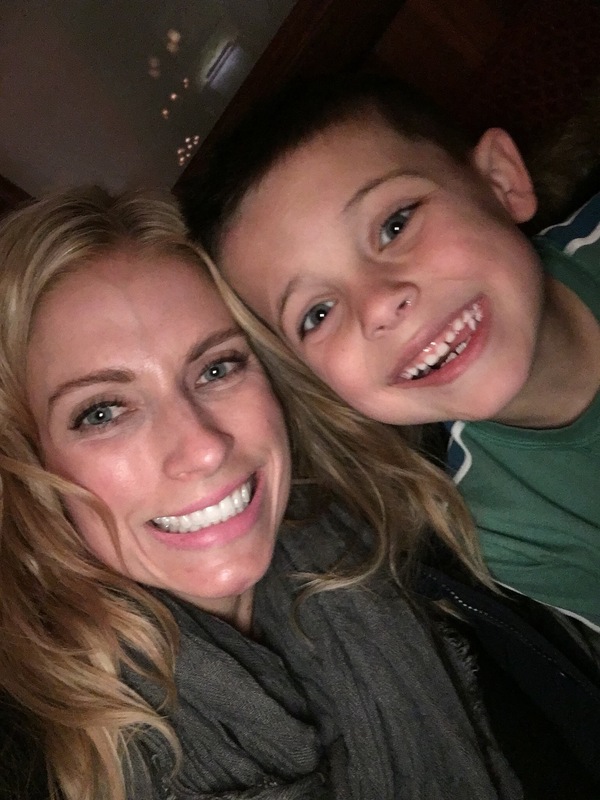 I have a ton of recommendations for people with kids. For brunch, check out Ted’s Bulletin on 14th St. for homemade Pop Tarts. ‘Nuff said. Open City at the National Cathedral is great as well and the kids can play in the beautiful Bishops Garden in the shadow of the Cathedral. If you go on a weekend, the Beauvoir School playground on the Cathedral Close is amazing and open to the public. The National Portrait Gallery is wonderful in Penn Quarter and a great place to stop for a coffee if the weather isn’t great. Kogod Courtyard is covered and the kiddos can run around. They have a scavenger hunt you can do with kids on weekends and even let you borrow little dolls of famous people from some of the paintings that you have to find. The new modern art wing of the National Gallery of Art is fabulous with kids! The food in the cafe in the Museum of the American Indian is really unique and good. Another fun and free Museum that is often overlooked is the National Postal Museum right by Union Station. 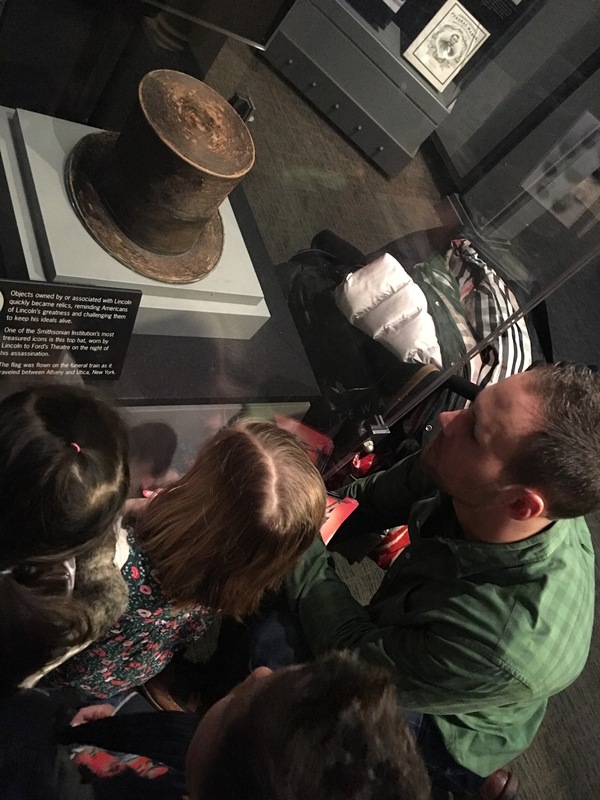 If you want to know what events are happening when you visit, check out the blog Kid Friendly DC. There are also a ton of theater performances for children in the area (Imagination Stage in Bethesda, Adventure Theater at Glen Echo). Hope you come back and get to enjoy the city again! Hope you looked down at the Lincoln Memorial to see where MLK Jr. gave his famous I Have a Dream speech from the top of the steps! Probably hard to see in the dark, but there’s a plaque stamped into the spot. Yes! In the daylight if you pour water over it, it will show up in your pics! Glad you enjoyed your trip. I have never been a history buff, however, I fell in love with DC. The architecture, the history, and the people. There is so much to see and do. 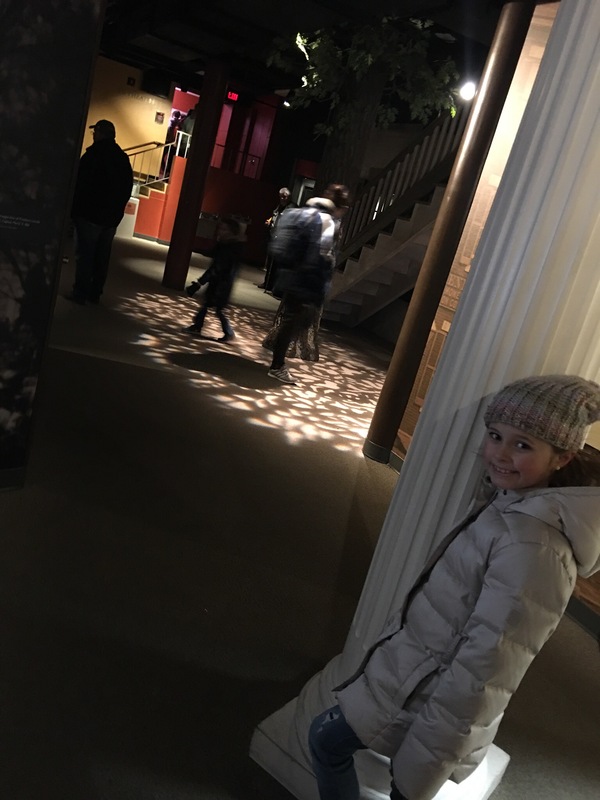 A few of our favorites (besides the ones you mentioned) were the Spy Museum, the Holocaust Museum (my husband and I sat on a bench and waited for hours for our youngest daughter to make her way through (she was in high school at the time). 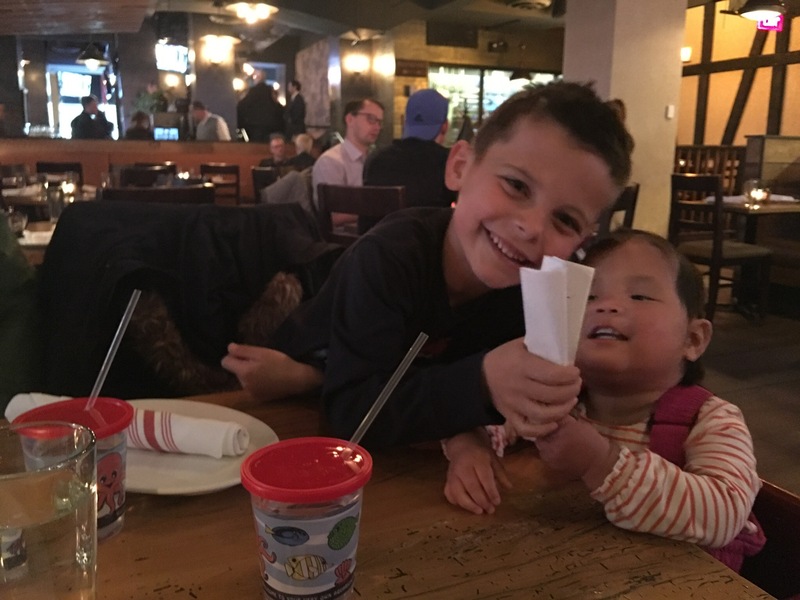 There are so many restaurants with great food and it is all kid friendly. And the best part is you can walk everywhere. I believe the city is only nine miles wide. Very easy to get around. I had no idea so many things were free in D.C. We hope to get there one day! I’m with Smith! My admiration for Lincoln runs deep. If you happen to be in DC around Christmas time, you should definitely see “A Christmas Carol” at Ford’s Theatre; one of the best performances I have ever seen, including Broadway. To be in the same building and atmosphere as he was is an incredible thought. 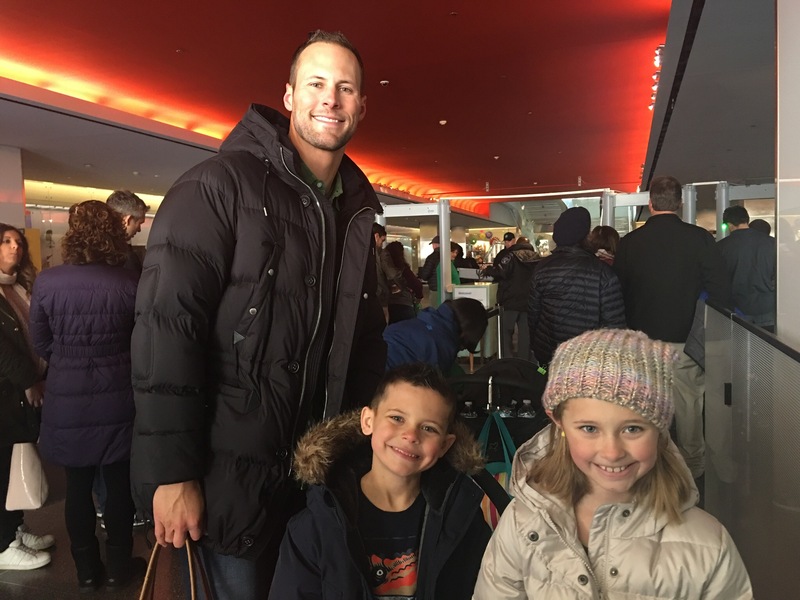 I have done a dual Christmas trip and taken the train from DC to Penn Station in NY, which may be a fun trip to take with your kiddos in a few years! I’m giggling that you called them “ski pants.” They’re snow pants and kids in Michigan wear them outside from November till the end of March (and sometimes April)! But D.C. Does look like a great trip for everyone. I should plan a trip some year for my family. What age range might be ideal? I was thinking a little older. Mine are currently 3,6 and 9. Bahahahaha! I didn’t know what to call them. Let’s just be glad I didn’t call them something even sillier :)! And I think your kids are at a great age! All three of my big kids found things they loved!! Your trip recaps might be my very favorite posts!!! Such fun! I’ve been to DC once and plan to go back with my family someday. Looks like a great time! I think I would personally need a stroller! You came to DC at the perfect time! Most of the spring breakers really started to arrive this past week, so it’s been crazy busy. You seemed to fit a ton in the first few days, as well! I’ve lived her for almost 3 years and I still haven’t experienced everything!! Y’all look like you had a blast! Love your trip recaps!!! I won a trip to D.C. with a youth tour group when I was 18 and loved it!! Initially I did not want to go and my mother insisted!! And as always she knows best!! I have great memories from my trip! Looks like y’all had a blast! I wouldn’t have thought about it being such a kid friendly city! But looks perfect for your crew! 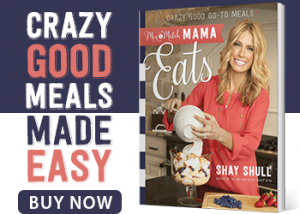 This is so awesome Shay! Thank you for sharing! 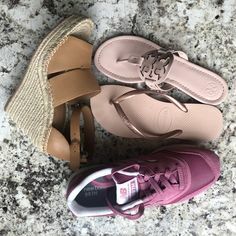 We are taking a trip this summer and I’m so glad your blog is my one stop shop for all things food, travel, and fashion 🙂 Random question – what does Madeley sleep on when you travel? Avery (my 16mo old) has seriously outgrown a pack n play and I’m guessing most of the Air BnB’s don’t have toddler bed accommodations… Thanks for all your help always! I love this post! 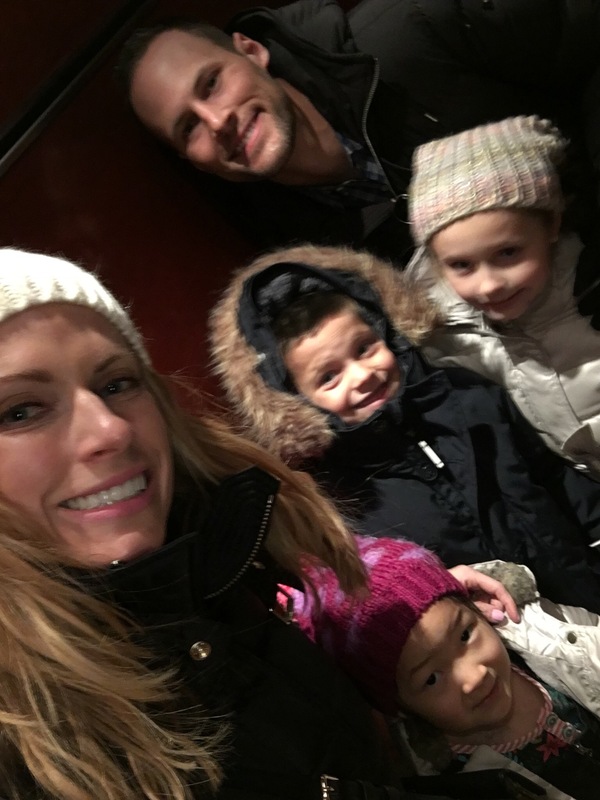 We feel we are finally to take our kids to cities for a vacation (similar ages to yours – 9, 5, and 3). We live near NYC, but other than that, we haven’t done any cities. We’re heading to Philadelphia this year for spring break and can’t wait! DC is on our list to visit soon! Thanks for all of the great info. Everything we did on day one and two (this post) was free. All of the activities!! I also had a son who loved Abraham Lincolin when he was little. You might want to research Gettysburg as a trip. It had been a long long time since we went there so I don’t remember details but we saw the room Lincoln stayed in & wrote the Gettysburg Address, a memorial where he gave the gettysburg address, took a carriage ride, saw the places the battles were, cemetery & more. We live within driving distance of DC and have been multiple times and still haven’t seen all there is to see. 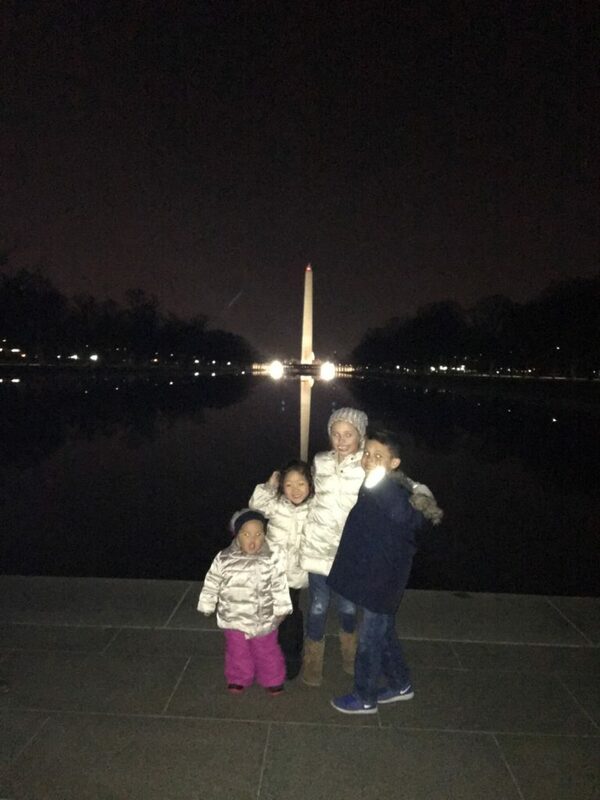 We do day trips and have never been in the city at night but may stay over at least once to see the monuments after dark. You always amaze me with how much you do with your young children. It’s wonderful! We are planning a trip to NY this summer and I will be taking copious notes from your NY travel posts. Thanks so much for sharing your trips with us , Shay! So excited to read about your trip to DC! We’re going to DC this summer with my entire family because it’s close to where my brother is stationed. DC is fabulous! We visited a few years ago with our kids and loved it. My favorite was the Lincoln memorial and Arlington cemetery. How super fun! I currently live in a cozy little DC commuter town called Kensington, MD; I am hoping PART II shows that you guys trained up from Union Station so your sweet daughter could get a pic in front of the Kensington sign (at our town train station :)). 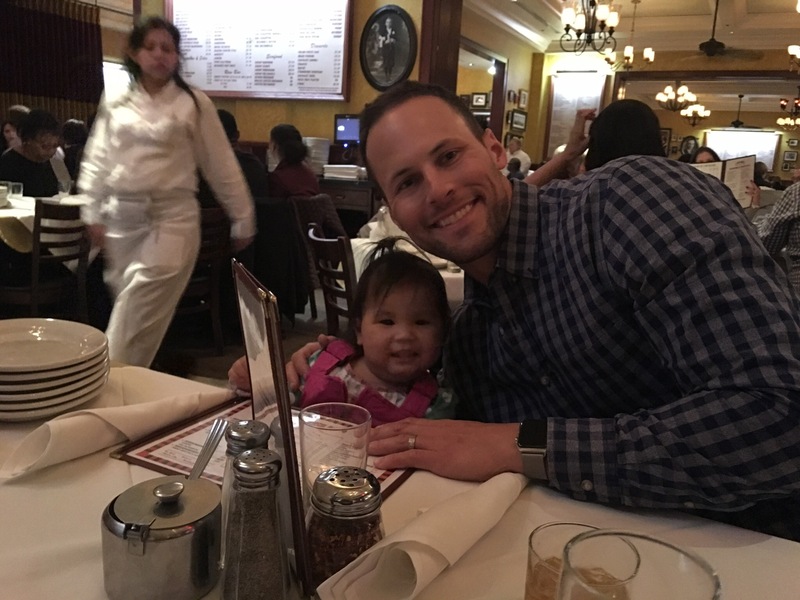 Our family of five loves Old Ebbitt Grill, which is super close to the White House and it has ALL THE FEELS of DC. 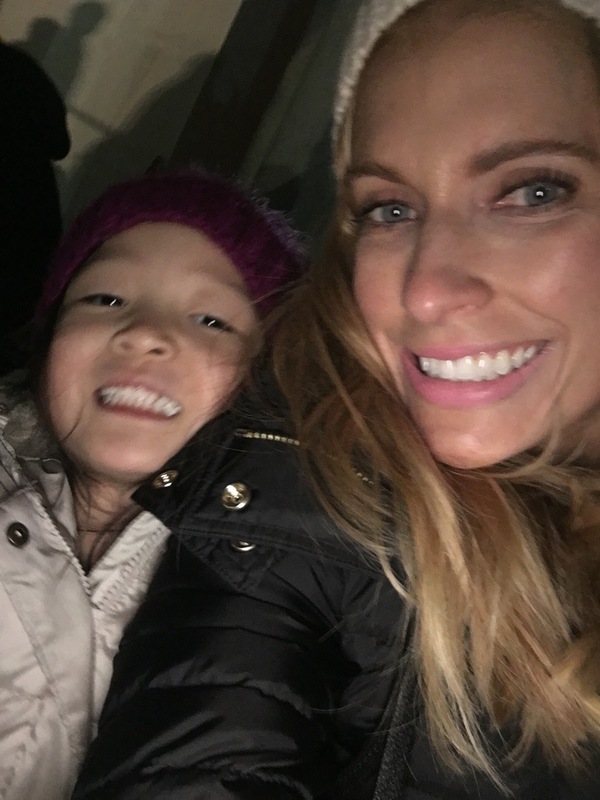 Blessings to you all- I actually gave a local mom your blog recently as she and her husband are heading to China soon to adopt their baby girl, and they had no idea what to expect. 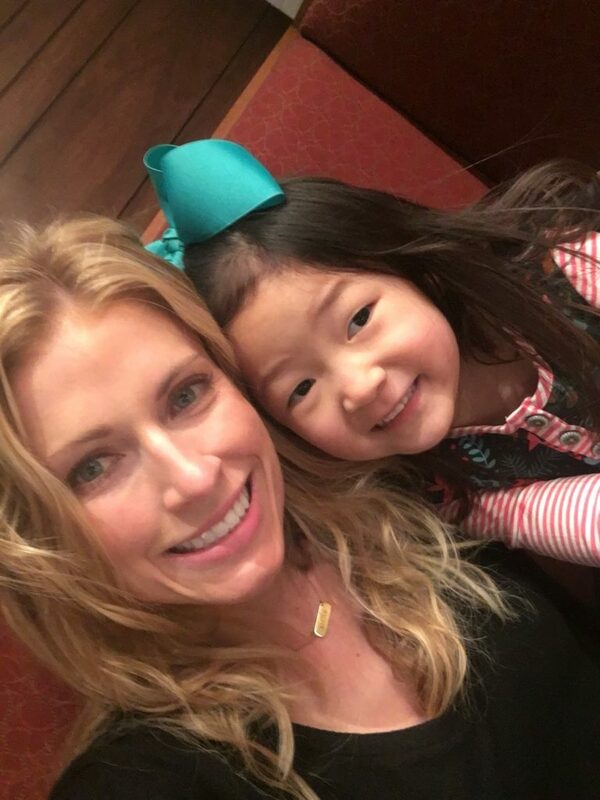 Your family could not be more beautiful! DC is such a WONDERFUL place! We went 2 years ago and we all agree it was our favorite vacation ever- even over Disney! 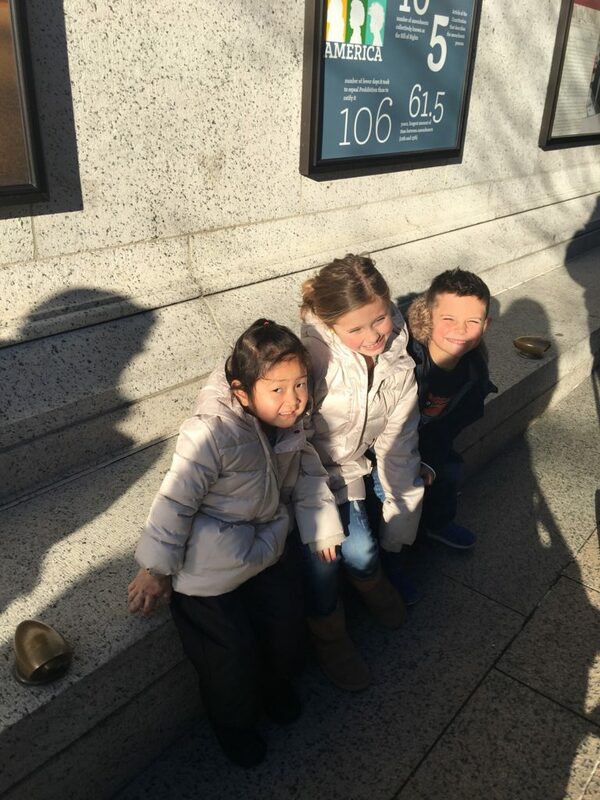 We contacted our Representative’s office way in advance and got a private tour of the Capitol with one of his staffers and got to meet with him afterward- we have pics of the kids sitting at his desk! The Capitol was their favorite stop of the trip- as opposed to the White House tour which they hated (kids!) Can’t wait to hear about the rest of your trip! I have to say that I look forward to your posts weekly, first thing I do is read your posts in the morning before getting ready. I do have a question and it’s not related to this post. I just started using the Glam Glow firming mask you blogged about and I’ve been using it in the evenings twice a week before bed. I absolutely love it!! My question is, do you put a nighttime lotion on after or does that defeat the purpose? I do use my lotion after it! I’m so glad you like it too :)! Shay! I am such a fan of your blog and I was excited to read that you all came to D.C.! I was born and raised here. It’s a great place to be. Your family is beautiful. Thanks for sharing! We moved to Maryland,about 45 min from D.C.,last August. We took our kids to see the monuments one random Saturday and had the best time. I kept asking my husband “are you sure it’s free?”! I couldn’t believe that the museums and monuments were free. Music to this family of 5’s ears!! Glad y’all had a great time and look forward to reading about he rest of your trip!! Glad you enjoyed D.C. That’s where I’m from. Just a reminder why all those great museums are free- thanks to the federal government and under threat with Trump’s proposed budget. We visited D.C. a few years ago and loved it! I kept saying the same things you did and could not get over the fact that everything was FREE! One of my favorite trips ever. We arrived in Mckinney last night! We are staying in a hotel there while we visit different sites. We’re currently on our way to Waco for Spring at the Silos, but we’ll be hanging out around Dallas the rest of the trip. 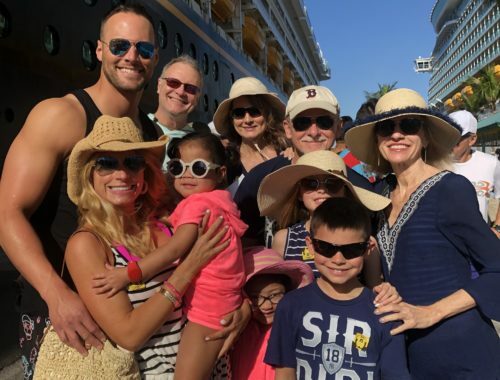 My family of 6 went last summer and like you, I was blown away at how perfect this vacation was for my family! My two youngest were 3 and 5, and they LOVED it as well. In addition to all the things in the city that were so amazing (and yes, free), my family absolutely loved George Washington’s Mt. Vernon. We almost skipped it, because it required arranging transportation, but it was amazing and we were all so glad we went! 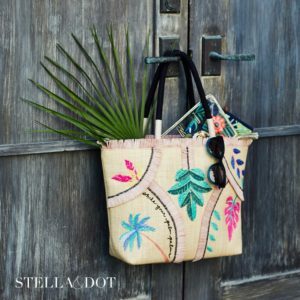 Oh my goodness, every time I read your blog it gives me the travel bug! As a history buff (and history teacher) I’ve wanted to go to D.C. for a very long time. Thank you for sharing all the info, very helpful to plan a future trip! I used to work at the White House! Next time you go, you’ll have to get a tour. It’s incredible! I totally want to go to DC next year for spring break now, I think my kiddo would love it! I went when I was in high school for a choir trip, but I’m sure I would enjoy it even more now 17 years later! We went simple & low key this year & drove down to Galveston. Learning that everything is free makes it all the more enticing. Thanks for sharing! I love reading the experiences of people who come here since you are all always so excited and have a great time! Living here, I always forget everything there is to do because it’s just normal for me! Hi Love the pictures and write up on DC. You’re a beautiful family. What was the name of the Airbnb that you stayed in? We are a family of 5 and it is hard to find hotel accommodations. 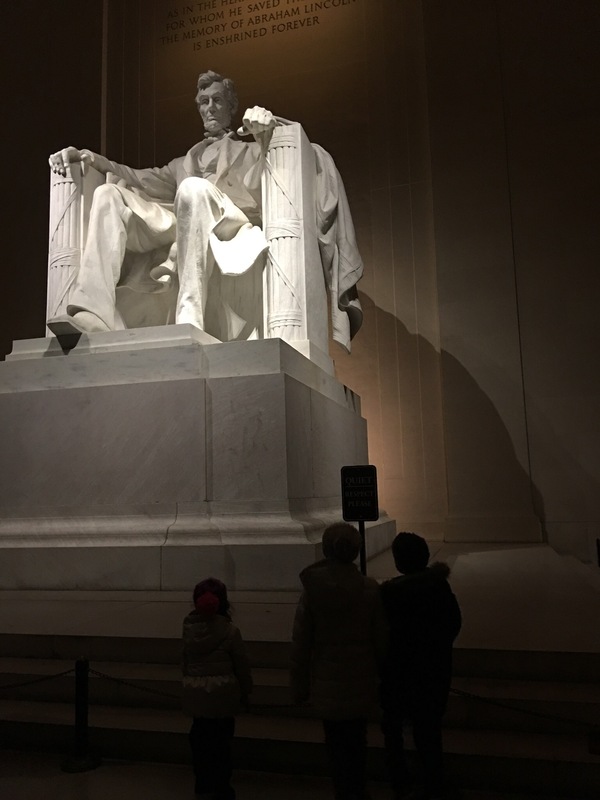 Hi, I am a retired elementary teacher and think it is wonderful that your son is so interested in Abraham Lincoln. May I suggest the book, Just Like Abraham Lincoln by Bernard Waber? It is a picture book, suited for reading aloud. Some other books by Bernard Waber include Ira Sleeps Over (one of my favorites) and Lyle, Lyle Crocodile. You’ll have to bring Smith to Hodgenville, Ky is he’s obsessed with good ol Abe. Hodgenville is the home of Abraham Lincoln’s birthplace. There is a museum and the Abraham Lincoln National Park is here too.